Reports. Numbers. Charts. It's important to be able to see your data to make business decisions, and even more importantly, seeing it in a way that makes sense to you. onCourse comes prepackaged with a large range of reports. You can use them as is, or copy and modify any of them to suit your needs. You can also create brand new reports from scratch. The first thing to be aware of when attempting to print a report is that you must be in the right onCourse list view to print a report. 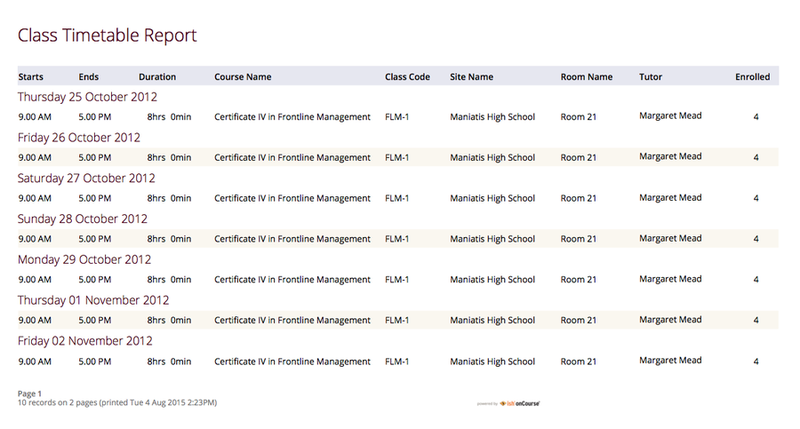 For example, Class roll is a report available from the class list. You can not print this report from inside the class record, or from the general window. You must open the class window first. All reports are printed to a PDF file which you can save to your computer, email, or print to a printer on your network. Your computer will need to have a PDF reader installed to create and view the report. For exports to excel, XML or other formats, see the chapter Importing and Exporting. Before you print a report, you will usually need to collate your data by running a query on it first. For example, if you wish to print the class rolls for all the classes starting this week, you will need to do an advanced query for classes starting from today, to the last day of the week. For more information on queries, see the chapter Getting Started. The print dialogue box provides an alphabetized list of all reports available via the given window, simply select the relevant report and a summary description is provided of the highlighted report. This description will also clarify as to whether the report prints in Portrait or Landscape format. In the print dialogue, you will be asked if you want to print selected or all records. A record count will be given for each option. Choosing 'selected' will print the results you have highlighted manually, while choosing 'all' will print the report for the one or more records you have selected in the list. onCourse printed reports can be set up with a defined background or overlay allowing the user to utilise different backgrounds or headers dependent upon the particular report. 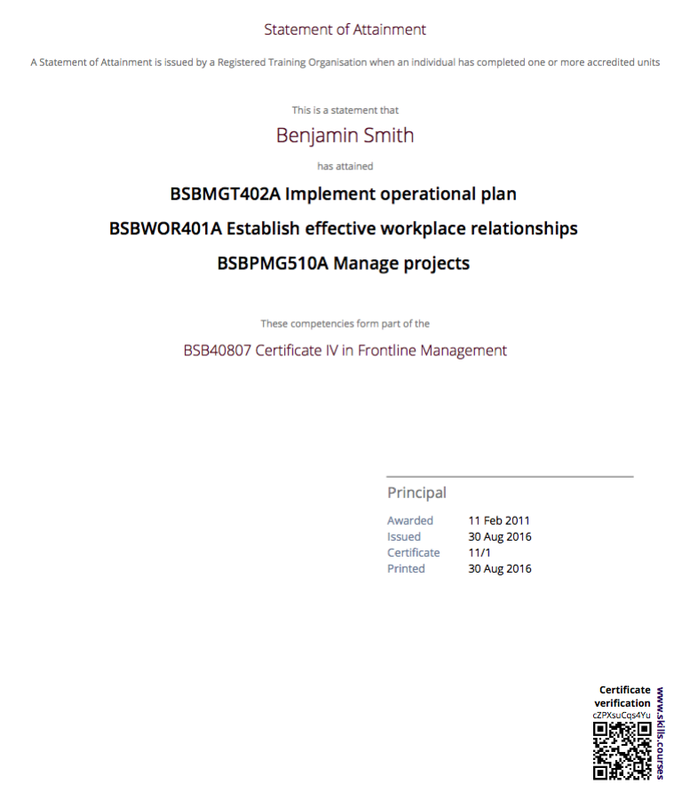 These backgrounds can be set up as a PDF document that is then imported into onCourse via the report window. Generally, a college will have a standard 'letterhead' style background, available in both portrait and landscape modes that can be used as the print background to common reports like invoices, enrolment confirmations and class rolls. In addition, the college may have one or more background reports for their Qualification, Statement of Attainment, Transcript and Certificate of Attendance reports. These backgrounds will usually contain formal elements such the colleges contact details, RTO ID, the business logo, the AQF and/or NRT logos and possibly the certificate signatory details & signature. They also may contain optional design elements such as borders, background images or watermarks. By using the background function for activities such as certificate printing design, with only the text based contents coming from the onCourse report, a college can modify their backgrounds at any time,without access to sophisticated software or report writing skills. 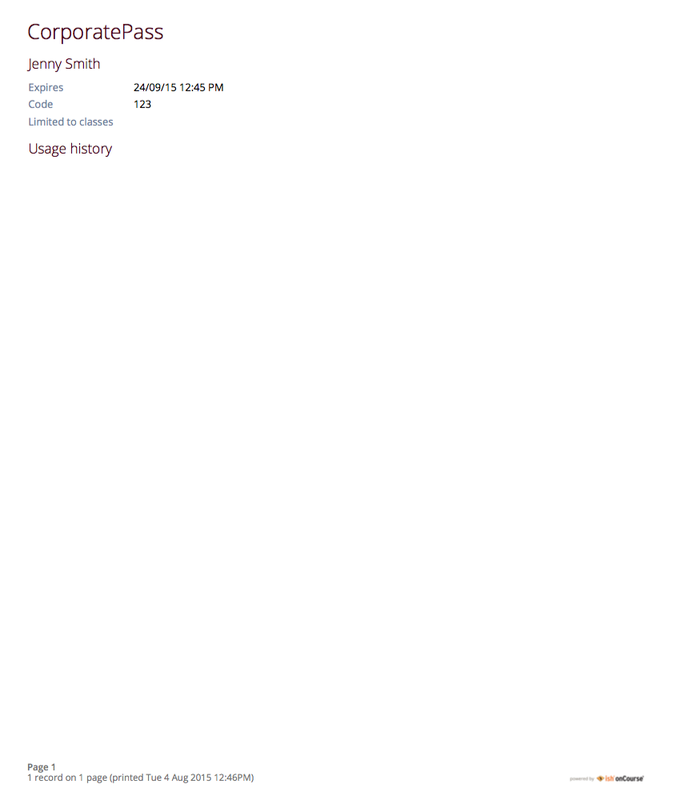 As a general rule you will have about 30mm at the top of the first reports page to add you logo and any text around it. If you want the exact dimensions you can go to the Reports list view, highlight the report you want to find these dimensions for, then click on the cog wheel and choose the option 'Save report file on disk'. Then to open the file you would have to download a tool called JasperSoft Studio, more information about this can be found in the Creating custom reports chapter of the user manual. Create a new Microsoft Word or iWork Pages document and ensure that the page set up is set to Portrait. 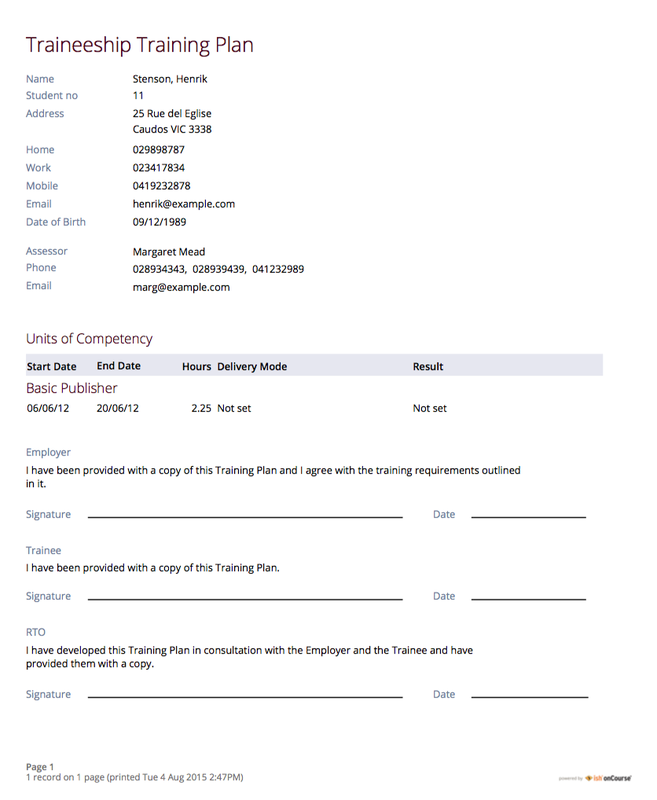 Open up the Header for the new document and place the required logo and contact details you wish the report to display. Ensure that the elements that you place within the header do not exceed the dimensions of the report header space. Once you have completed the set up of the page header, save the document as a PDF so that it is ready to be imported into onCourse as a background. Make sure that you clearly label within the name of the PDF whether the document is Portrait or Landscape format. Reset the original Word or Pages document to display in Landscape format, then realign the elements within Header to ensure it fits within the dimensions of the Header. Once you have created the print backgrounds for your reports, you can now import those PDF backgrounds into onCourse and attach them to the specific report. You only need to import each report background once. The first option within the drop down menu of available backgrounds is 'no background'. If you select this option it simply means that the header of the report will be blank (no logos or text will appear). 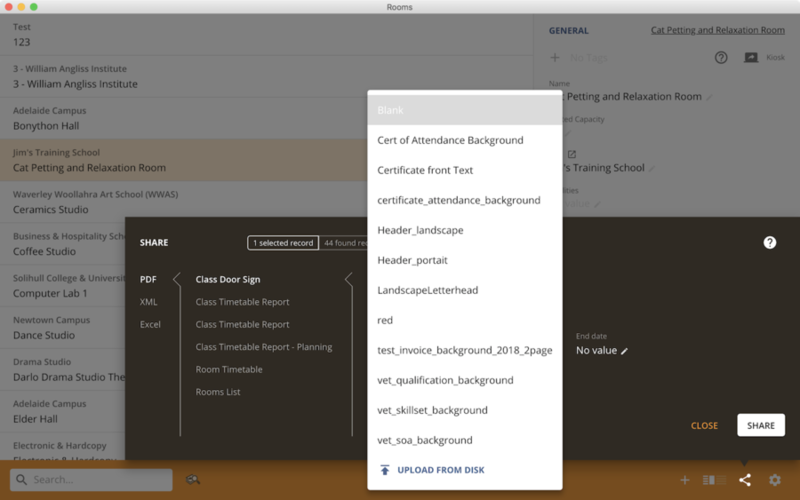 The drop down menu will also display any other backgrounds that you have previously imported into onCourse. As per the following example, this is where the naming convention of the backgrounds becomes very important, particularly with respect to whether the background is in Portrait or Landscape format. If you select a Landscape template for a report which is printed in Portrait format, the report will not work. If you wish to import a new background PDF document, select 'upload from disk' from the drop down menu, this will bring up a dialogue box to allow you to select the background you wish to use for this report. Note also that the newly imported print background will be auto selected as the background for the Report you are currently running by default. Once you have either selected an existing background or imported a new one from disk, you simply run the report, which will generate a PDF output of the report with the specified background. Check for any errors in the layout that you might see, and then correct them by opening up the original Word file used to create the PDF background. Once you've finished making your edits, re-save the background PDF and upload it to onCourse, following the same steps as above. The chosen report will display the last background used as the default when printing that report. But you can simply select an alternate background from the drop down menu or import a new background if you so chose. Once you have uploaded the PDF documents that become the print backgrounds for your reports, you can then manage these backgrounds via the Report window of onCourse. To access these backgrounds go to File - Preferences - Reports then select 'Manage print backgrounds' via the cogwheel icon of the Report window. A new dialogue box will appear, which allows you to either rename a background by double clicking on the entry, or to delete a background that is no longer being utilised. You can only import new backgrounds via the Print dialogue box when printing a given report. This process cannot be done via the Report window of onCourse. The ability to apply a print background to your Custom Reports provides users with a much greater level of flexibility particularly in reference to generating Certificates. One example of this is that if your College has more than one entity such as a separate Business Training College, by setting up different print backgrounds for each of your entities, including logos and branding, you can manage the generation of certificates for both entities with ease. Whereas previously the images were embedded within the Custom Report itself, these images are now part of the print background. You can also apply new backgrounds to your Custom Reports without the need to contact ish to request changes to your Custom Report, you can simply manage this by updating the print background that is used for the relevant custom report. Banking ReportThis report shows payments in and is designed to take along to the bank when you deposit your cash and cheques. Enrolment Liability ReportReport showing the breakdown of the outstanding liability held on each enrolment, (enrolment fee component not yet posted to the defined income account). 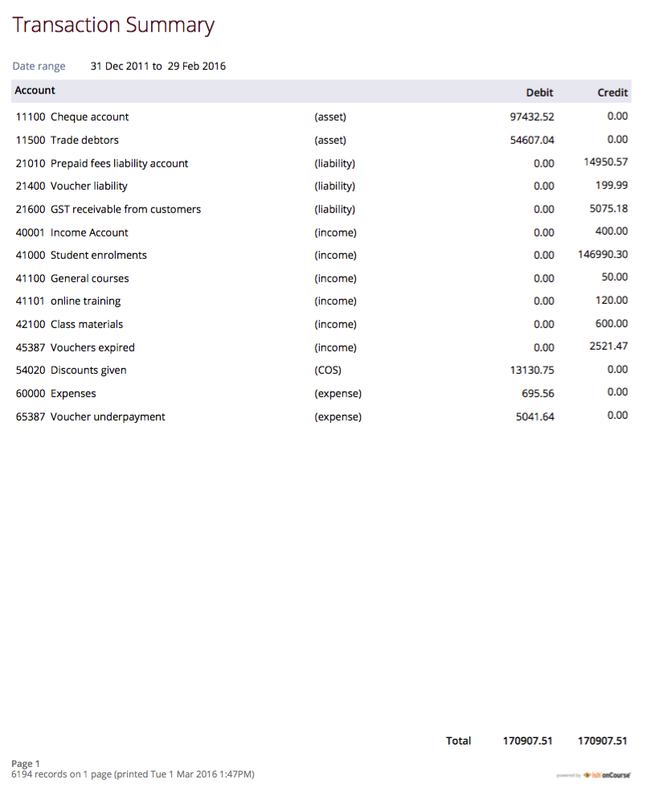 Transaction Detail Detailed report displaying transactions made to and from each general ledger account over a specified period of time. Transaction Summarya more general overview of transactions made over a specified period of time. This report is not based on cash positions, but invoices created and is used by most book keepers to provide their accountant with a record of assets, liabilities and income. 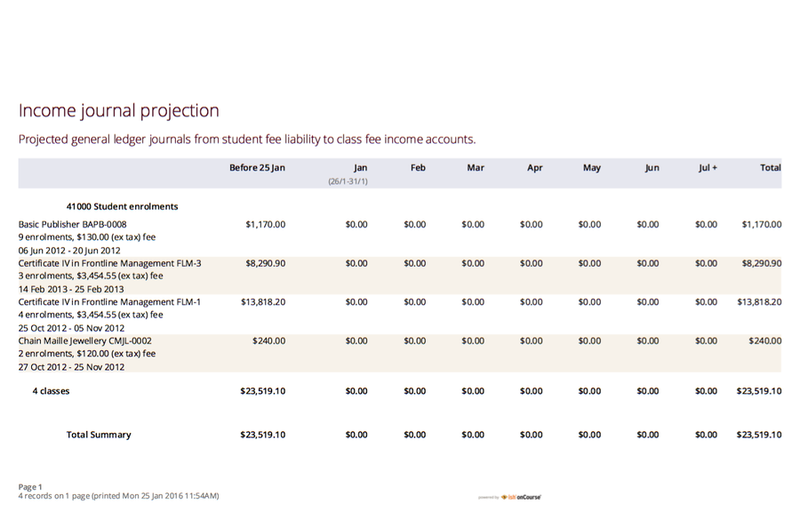 Income Journal Projection Report The projected pre-paid fee liability to income journals for each of the next 7 months from the date the report is run, for each class. 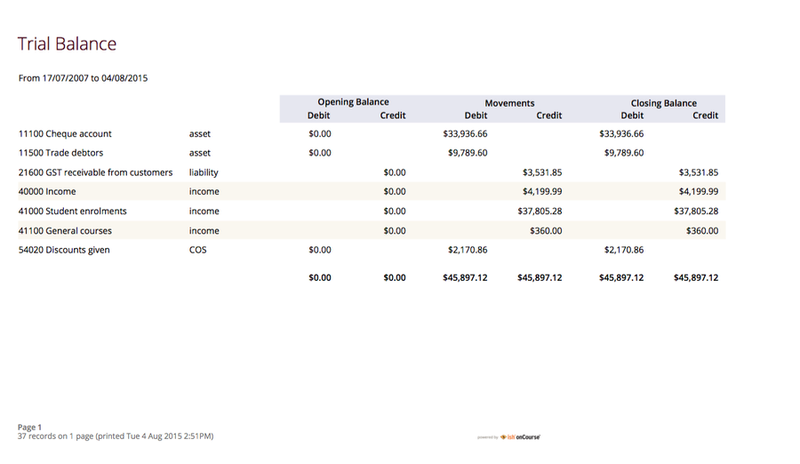 Income Summary Projection Report The projected pre-paid fee liability to income accounts for each of the next 7 months from the date the report is run, for the selected classes. 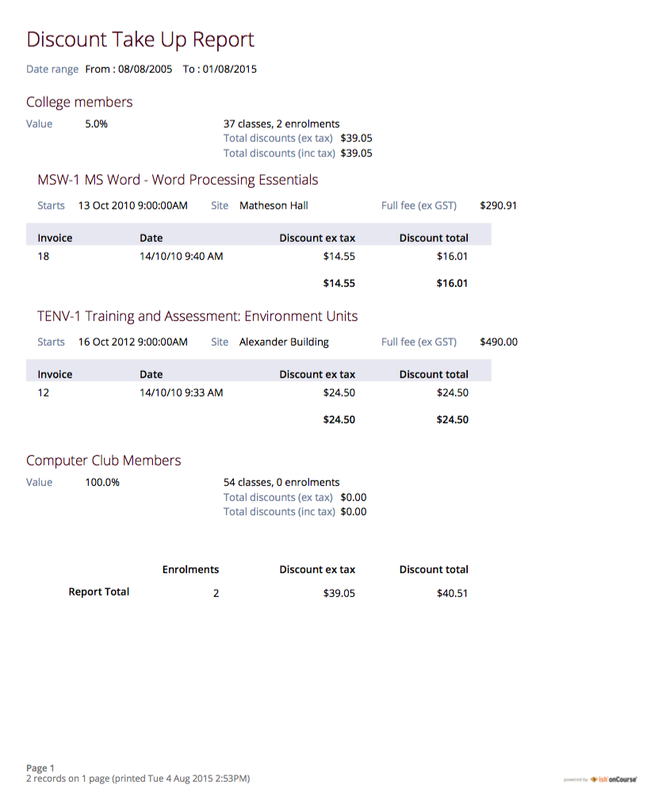 Discount Take Up Report This shows the detail of the enrolments which have taken up a discount offer, and groups by each discount type each class and its enrolments from the date range entered in the report runner. 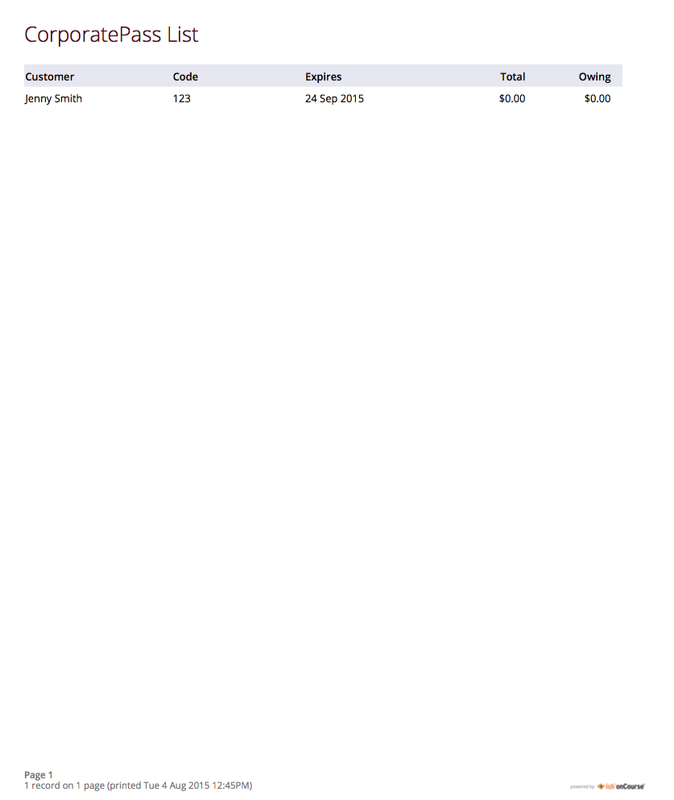 Discount Take Up Summary Report The total discounted invoice lines for each class joined to the discount, created during the date range specified. Enrolment Summary by Account Report This report breaks down the number of enrolments and Income made per account code. 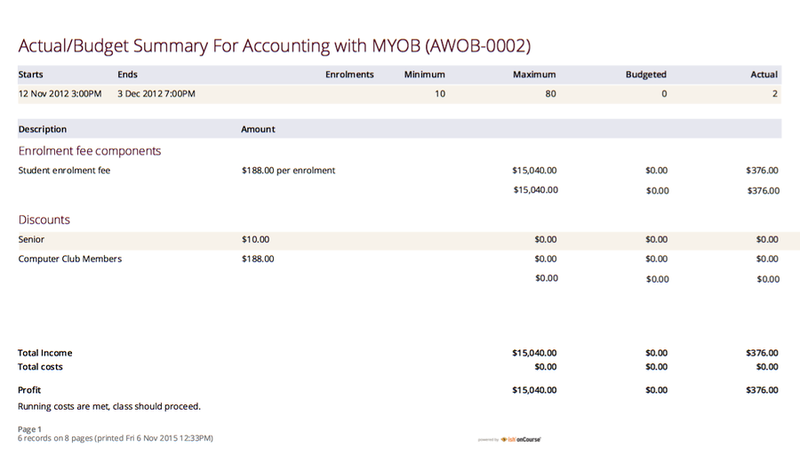 Enrolments and Income by Account Report This shows you the income and number of enrolments every account has taken per class, so a more details version on the Enrolment Summary by Account Report. Sales ReportThis report provides a comparative analysis of sales figures from one College site to the next. 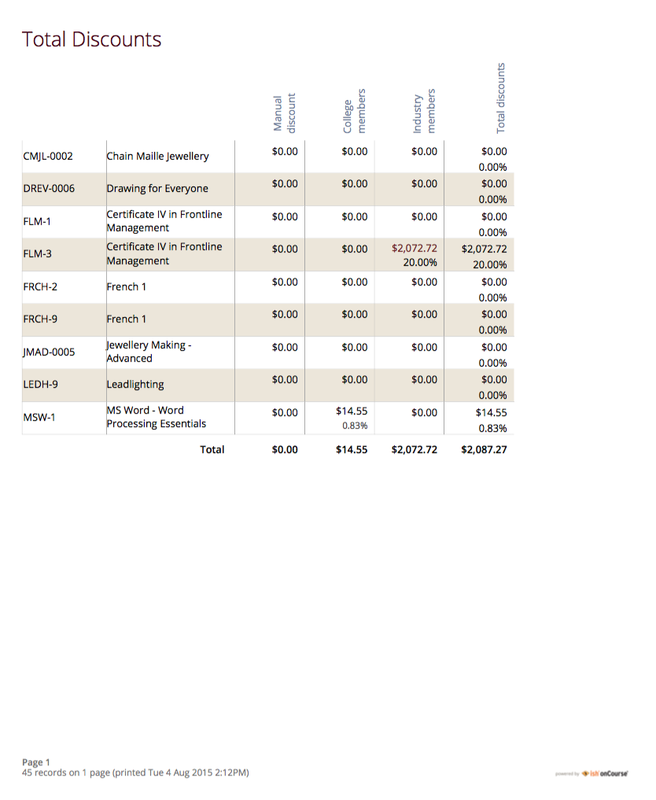 Sales By Course Location ReportList of the number and monetary value of enrolments categorised by Course and College Site. Discounts by ClassList of all discounts for a given Class and their take up value. 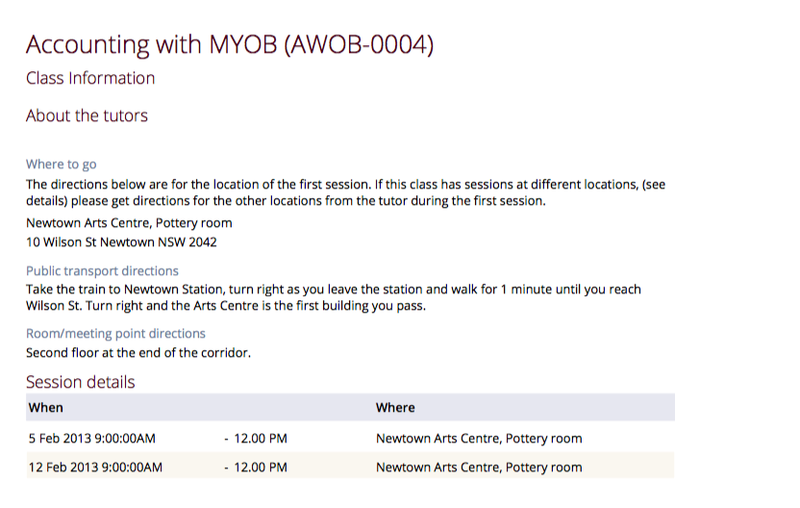 All Class Details Detailed report of all information for a given class, including enrolment numbers, session details and course details and directions. Class By Site Summary of all classes against a given site or sites. Report includes summary enrolment information and Male Female breakdown. Site Details The details of a particular site as it has been set up, including directions, room listings and capacity. Class Tutor List List of all Tutors by Class, includes site information and start end times for sessions. Class Sign Report that can be printed out and used as a sign / label on door of Training Room. Wait List ReportList of all current wait list entries received. Total Discounts Details of all discounts given for a range of classes, grouped by discount name and class. Invoice Report Invoice showing GST and non-GST fee components, plus balance outstanding. 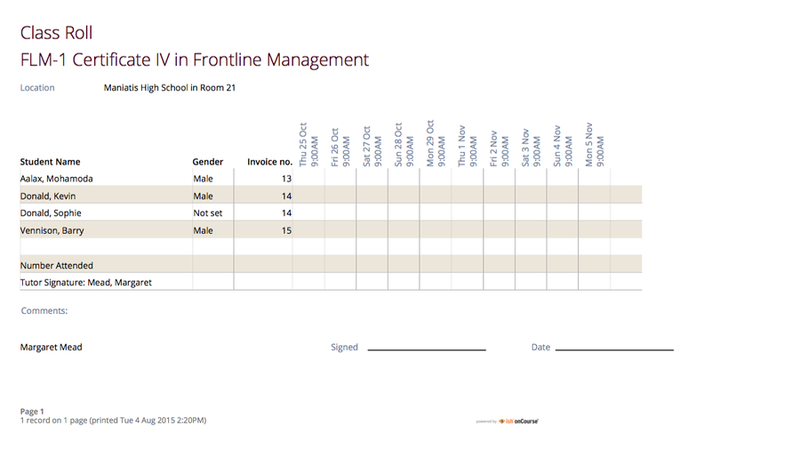 Class Roll Session by session grid created for marking student attendance, including tutor sign off on attendance sheet. Class Roll - Single Session A standard document that lists all the students in a class, tutors return this roll each session or week. Users need to print multiple copies of this roll if they require one for each session of a class. 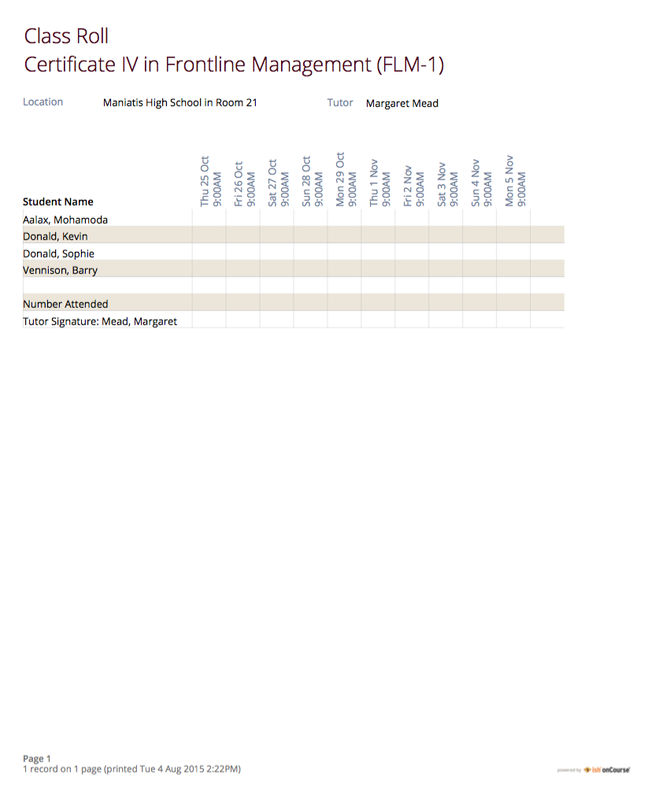 Simple Class Roll Session by Session grid created for marking student attendance. 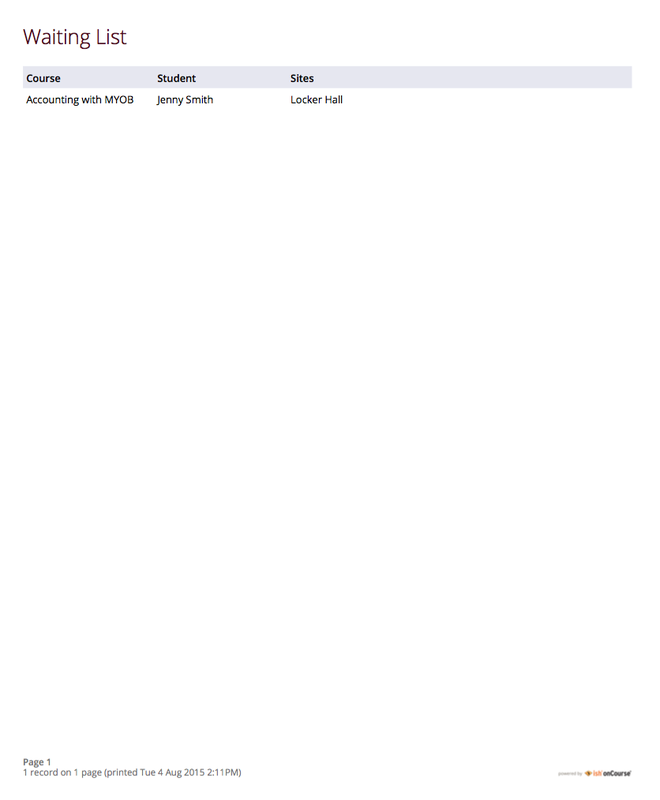 Class Timetable allows the user to select multiple classes and print a date-range specified timetable of sessions to show the students when and where to turn up to class. Class Timetable Planning this is an alternate version of the class timetable report which includes the session private notes field. when and where to turn up to class. Class Roll Contact Number A report that provides a list of all students, their contact phone number, can be printed out and used for roll call. Assessment Outcome Report Provides a printable template for the Tutor to enter assessment outcomes for each unit of competency for students in a given class. Assessment Outcome Per Student Report Provides a printable template for the Tutor to enter assessment outcomes for a student in a given enrolment. 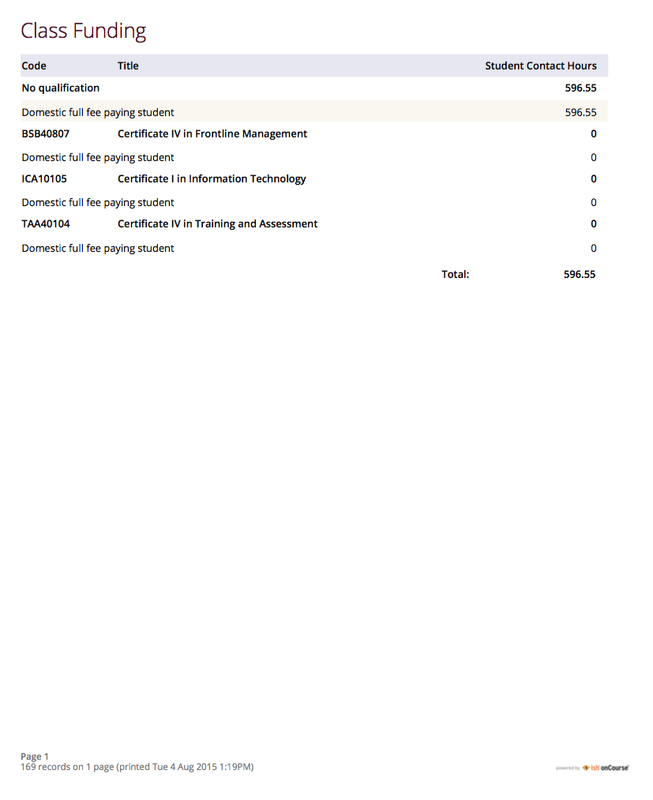 Certificate Statement of Attainment Report that generates a Statement of Attainment for partially completed qualifications. 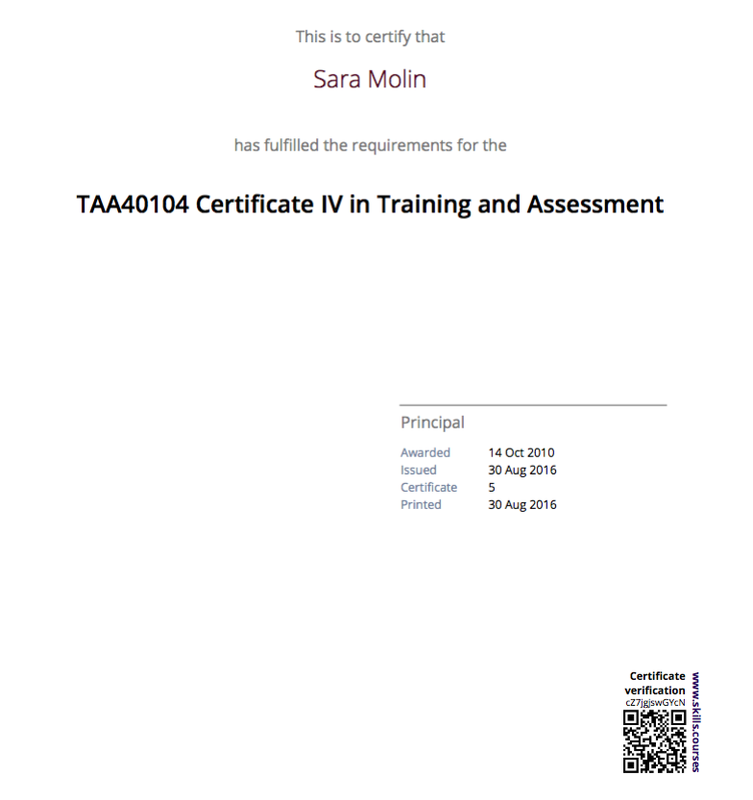 Certificate Qualification Report that generates a Qualification Certificate for students that have completed all requirements for a given Qualification. 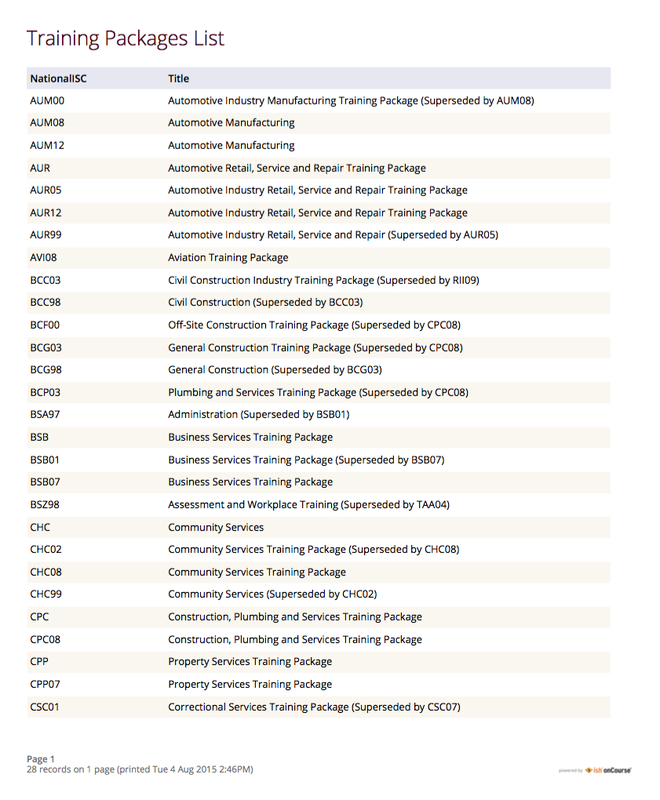 Training PackagesA list of all Training Packages available within onCourse. Traineeship Training Plan Provides an outline of the required units of competency within an overall Traineeship Training Plan for a given student. Class HoursA summary of the classroom, nominal and reportable hours for each class. Commonwealth Assistance Notice (CAN)This report notifies the student of their VET Student loan amount. If the student has a VET Student loan, you are required to provide a Commonwealth Assistance Notice to the student. 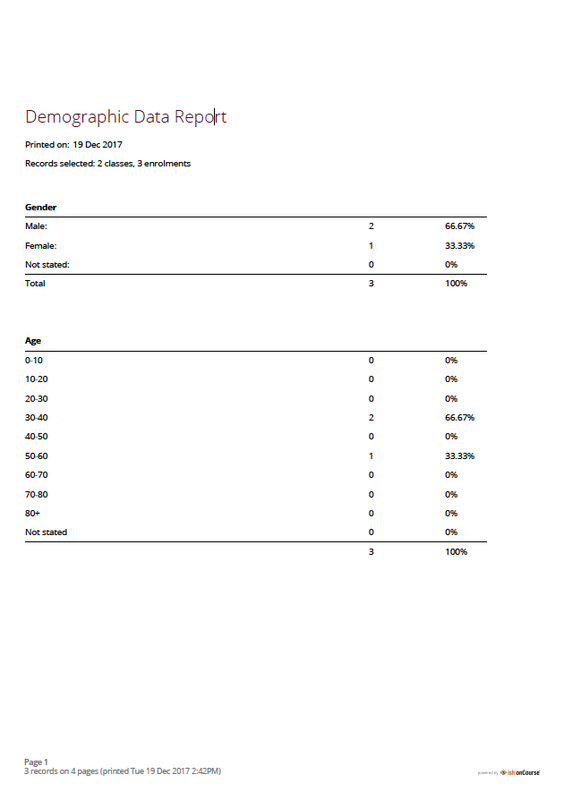 Demographic Data ReportThis report shows the aggregate the responses to the standard student demographic questions such as age, gender, residential suburb, country of birth and language spoken for a selection of classes or enrolments. 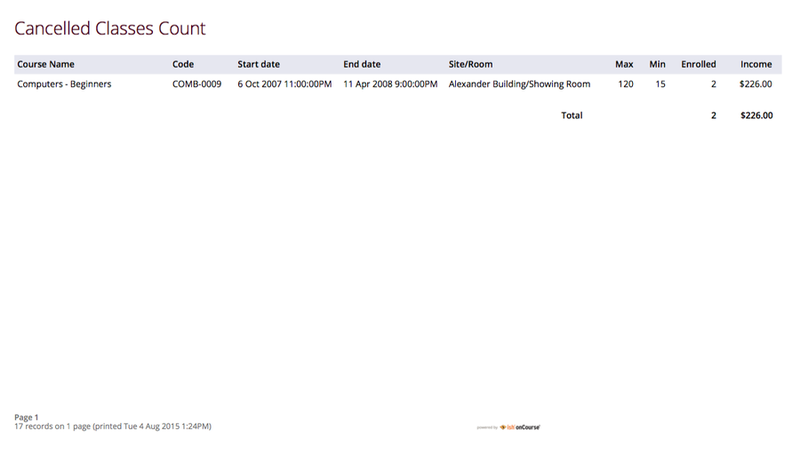 onCourse includes a range of printed reports as part of the standard software. These examples list the reports available and their purpose. Additional reports can be quoted and built on request if you do not have the in-house IT skills to build or modify your own reports. 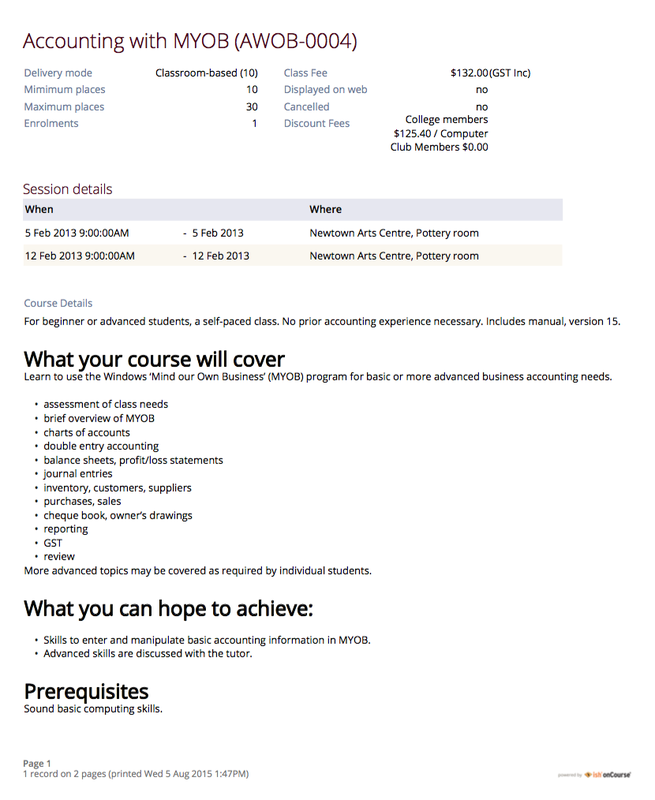 Use: To obtain a detailed print out of the budgeted and actual income and expense lines, one page per class. Report Location: From the Class list, select Share, then PDF and choose Budget Details. 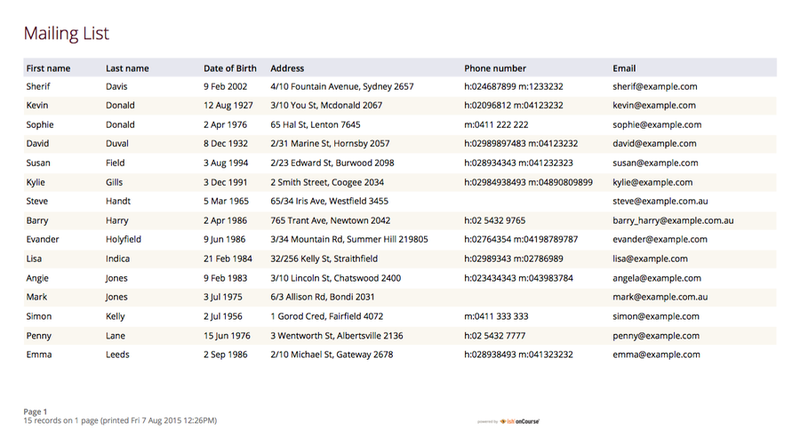 You can print all available records, listed records (based on a query you have run) or the highlighted records. Remember to select the appropriate background for this report then run the report. Report Location: From the Class Menu, select Share, then PDF and Choose Budgets. 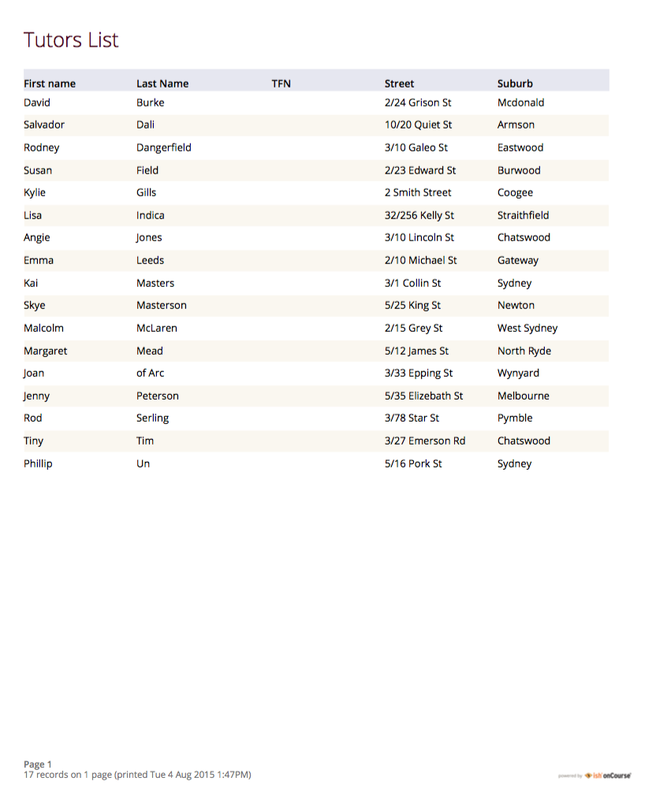 You can print all available records, listed records (based on a query you have run) or the highlighted records. You can suppress the class lines, to provide a summary for each subject only, or show each class. Remember to select the appropriate background for this report then run the report. In the example below, the classes are listed with the actual figures displayed. As detail has not been entered for the budget fields, the budget amounts are all listed as $0. 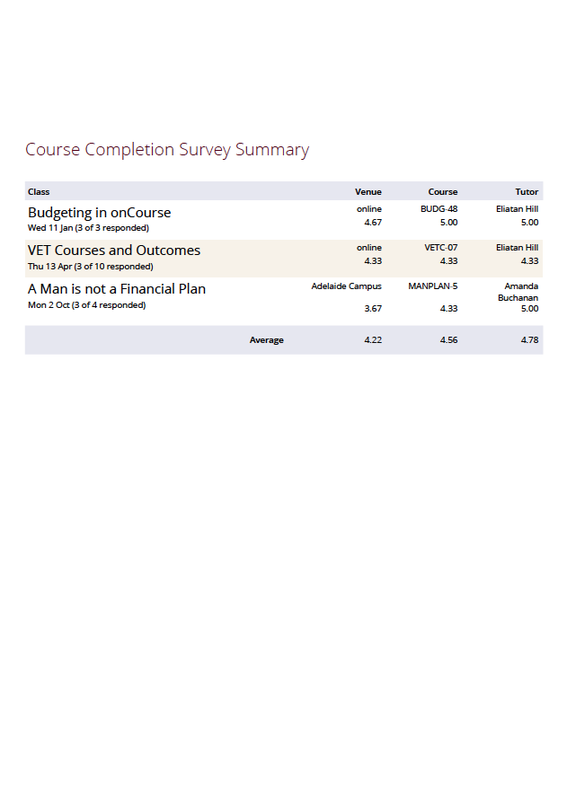 Use: Enables Colleges to monitor budget against actuals at the summary level, includes details by subject on the number of enrolments, income generated, expenses and the resulting variances. Report Location: From the Class window, select the specific classes you wish to run the budget analysis for. Select Share, then PDFand then choose Budget Summary by Subject from the drop down menu of reports. Remember to select the appropriate background for this report then run the report. Use: Enables Colleges to monitor budget against actuals at the summary level, includes details by Class on the number of enrolments, income generated, expenses and the resulting variances. Report Location: From the Class window, select the specific classes you wish to run the budget analysis for. Select Share, then PDFand then choose Budget Summary by Class from the drop down menu of reports. Remember to select the appropriate background for this report then run the report. Report Location: From the Class window, select the specific classes you wish to print the details for. Select Share, then PDF and then choose Class Invoice Record Report from the drop down menu of reports. Remember to select the appropriate background for this report then run the report. Use: To obtain a report of all cheque, cash and credit card payments processed since the last bank, to assign the money to the appropriate general ledger income accounts, and to generate a printed report, where necessary to provide to your bank with the cash and cheque deposits. Report Location: From the Financial Menu, select Deposit Banking. In the window that opens, you can see a summary of the cheques, cash and credit card payments collected since the last processed bank. You can check the option, Print Report, for a hard copy, as displayed below. The report can also be re-printed for only payments in or payments out from either of these menu options, for the date range you specify. Remember to select the appropriate background for this report then run the report. 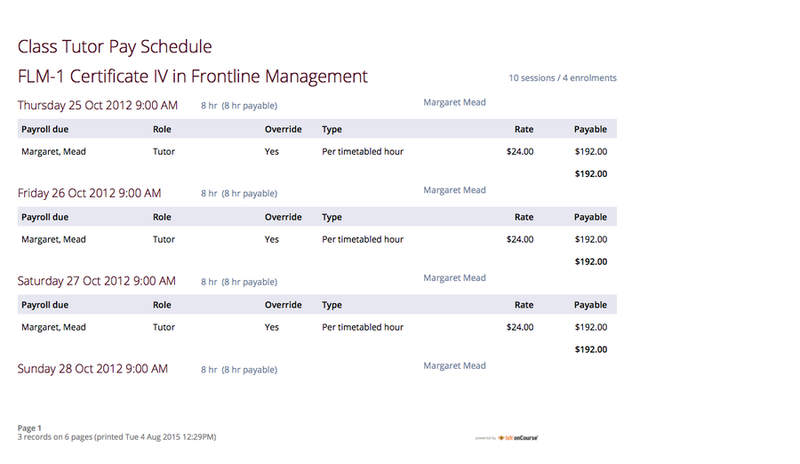 Report Location: From the Financial Menu, select Tutor Pay. 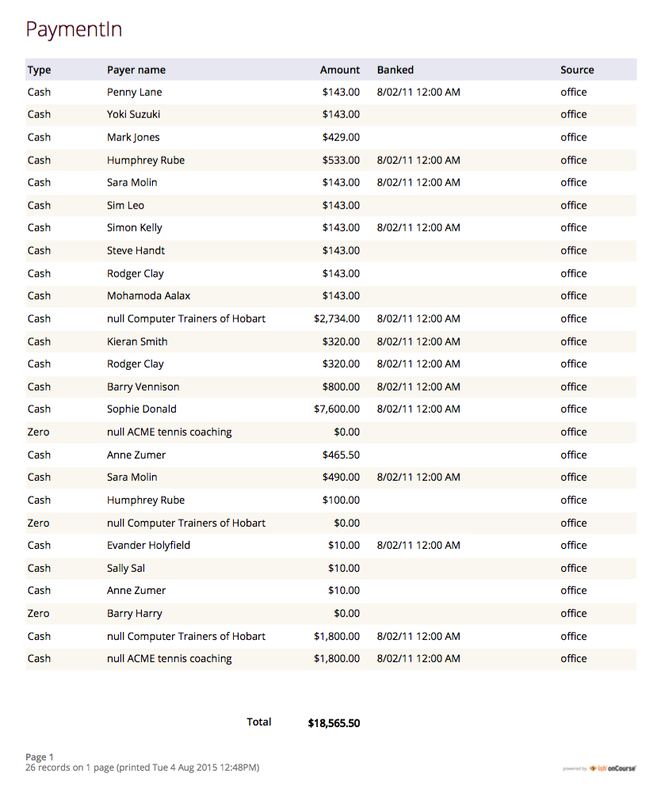 In the window that opens, you can see the full list of Payslips. Select Share, then PDF and then choose Payslip Report from the drop down menu of reports. Use: To obtain an overview of classes scheduled for each tutor. This report also provides the total hours the tutor is scheduled to teach for each class, which can be used for payroll purposes. Report Location: From the Class window, find the classes you wish to include in the report, such as a particular date range. Select select Share, then PDF and Choose Report Class Tutor List. Remember to select the appropriate background for this report then run the report. Use: This report provides the detail of the expected payslip lines that will be generated for all tutors attached to a class with wages in the budget, allowing you to confirm that the correct details have been entered at the class level prior to generating the tutor pay. Report Location: From the Class window, find the classes you wish to include in the report, such as a particular date range. 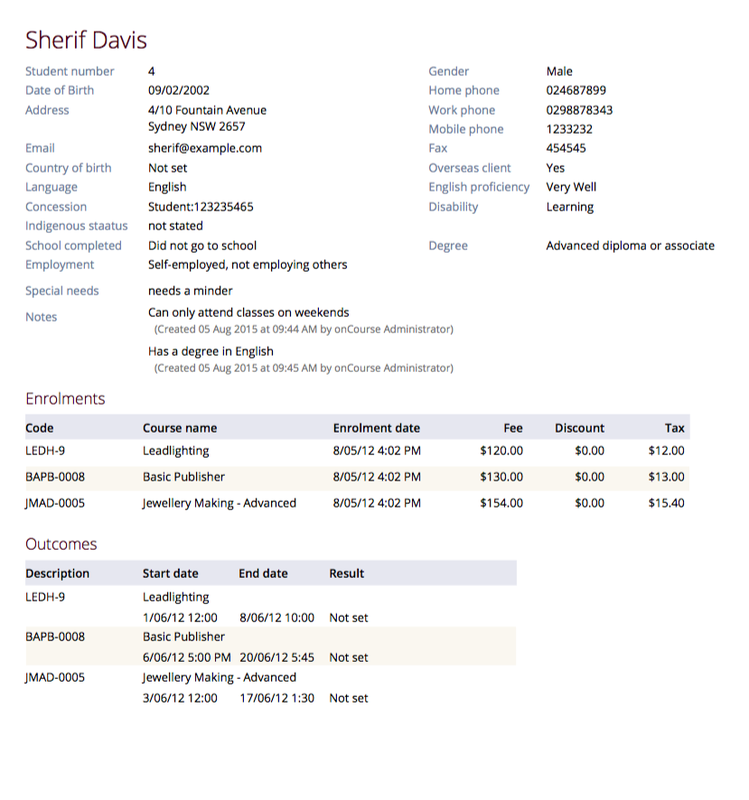 Select File, Print and Choose Report Class Tutor Pay Schedule. Remember to select the appropriate background for this report then run the report. 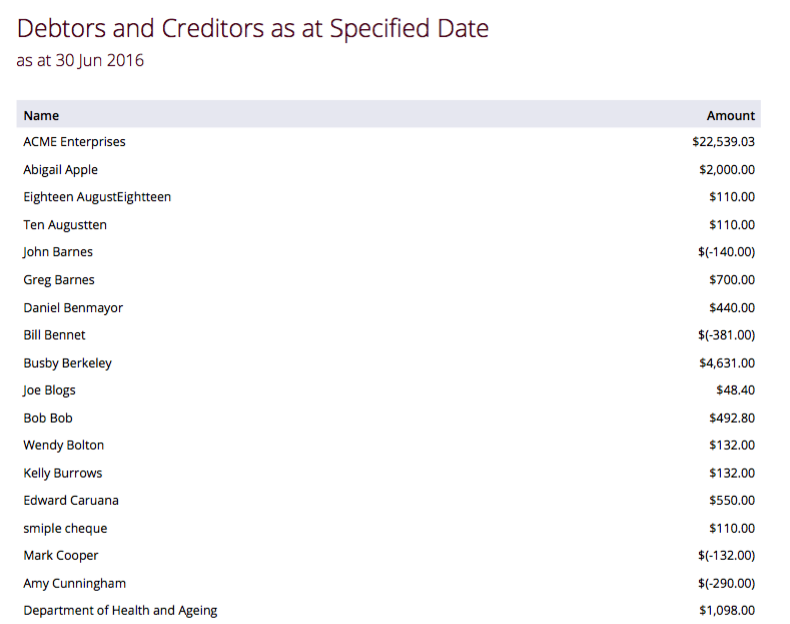 Use: To obtain an aged debtors and creditors report for all unbalanced invoices. This report can be run against invoices and/or credit notes. 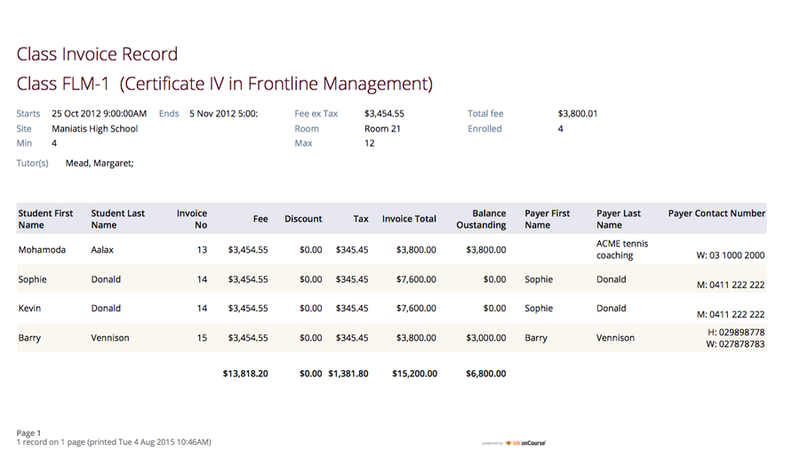 Report Location: From the Invoice window, select Share, then PDF and Choose Debtors and Creditors Report. Remember to select the appropriate background for this report then run the report. 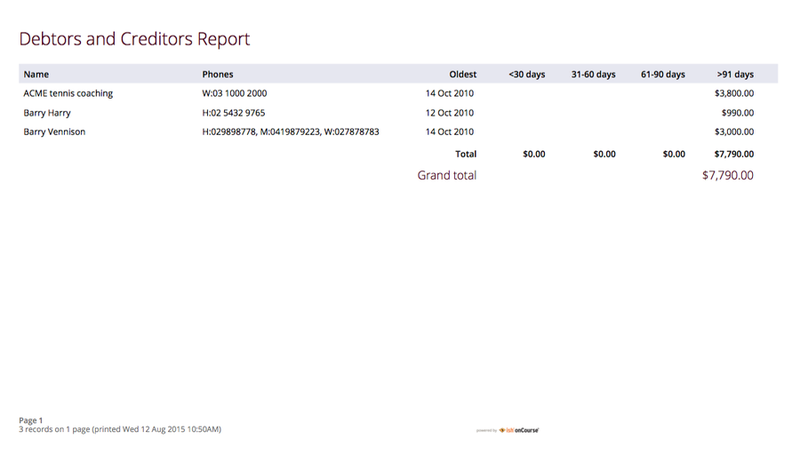 Report Location: From the Contact window, select Share, then PDF and Choose Debtors and Creditors as at Specified Date. Remember to select the appropriate background for this report then run the report. Report Location: From the Classeswindow, highlight the classes you wish to run the report against. 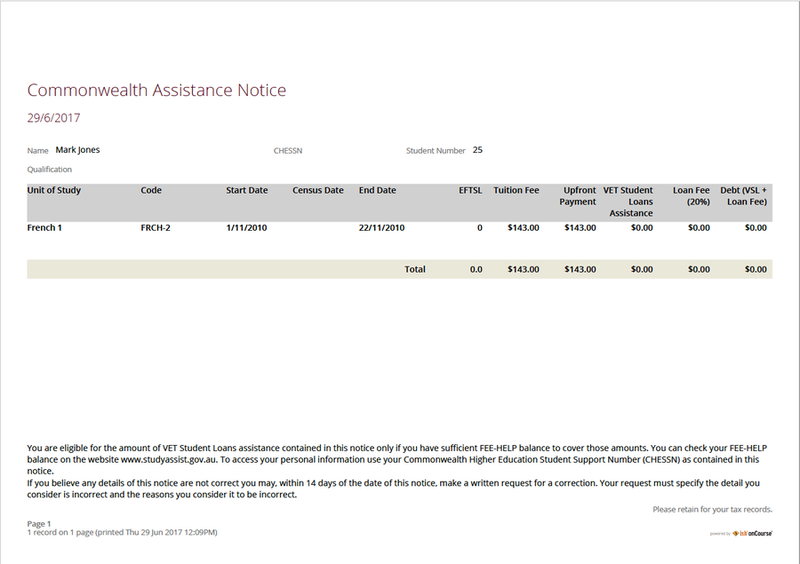 select Share, then PDF and select the Class Prepaid Fees Liability report from the drop down list. Remember to select the appropriate background for this report then run the report. Use: To supply hard copy Tax Invoices to students and other debtors. Report Location: From the Invoice window, find the invoices you wish to include in the report, such as a particular date range. select Share, then PDF and Choose Report Invoice. Remember to select the appropriate background for this report then run the report. 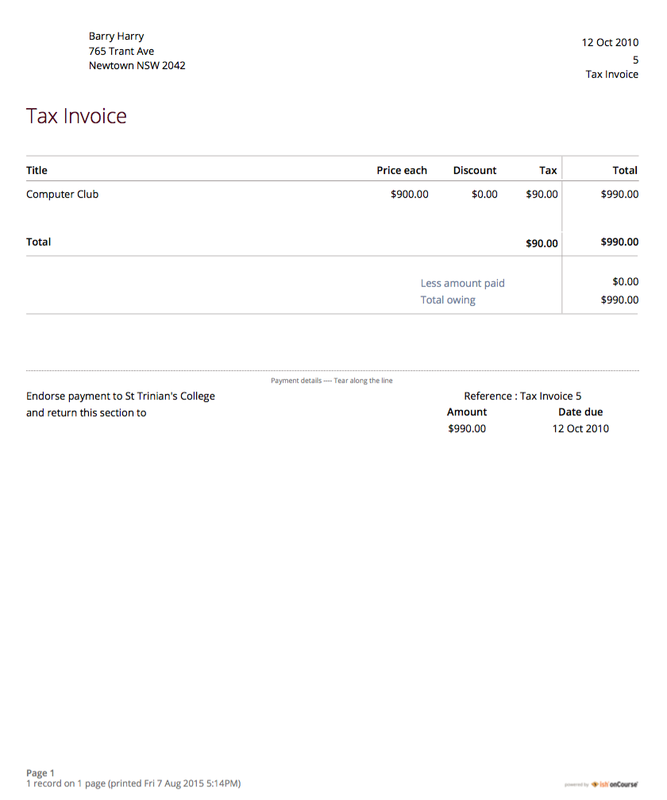 Report Notes: When a student is enrolled, and provides an email address, a tax invoice will be emailed to the payer, along with an enrolment confirmation, sent to the student enrolled. Often this will be the same person. 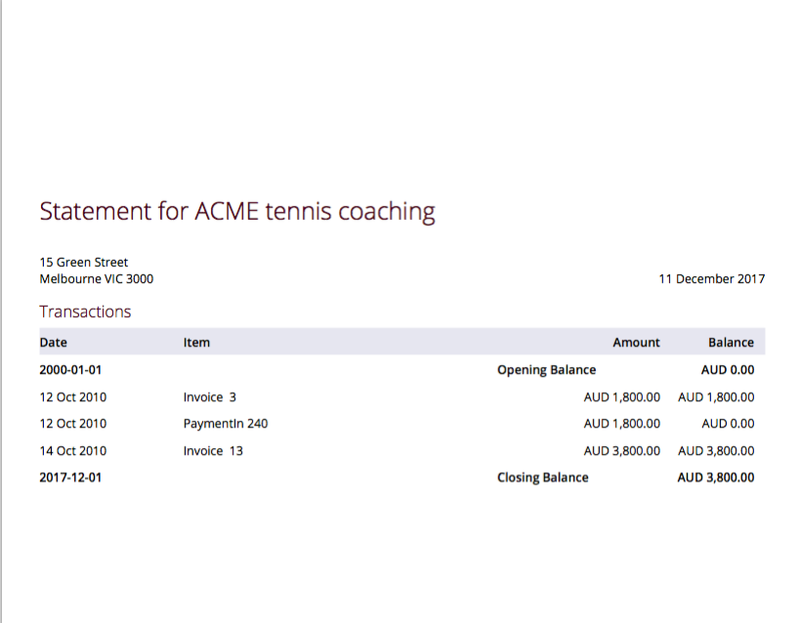 Other invoices, not relating to enrolments, can be manually created and printed via the invoices window. 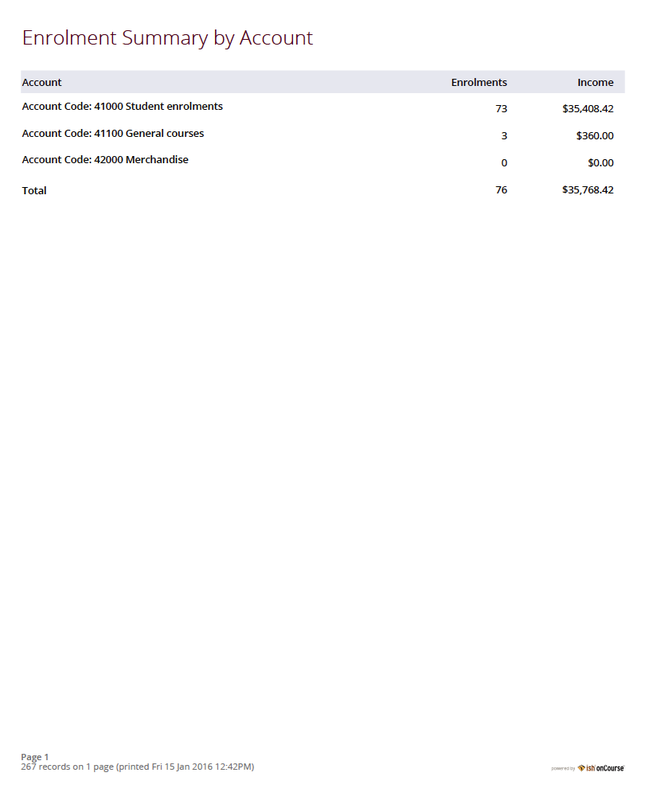 As seen below if you have enrolled into a class using a payment plan the Tax invoice will show you the next payment due dates and the amounts payable. Use: List of all current CorporatePass records. This report prints in Portrait format. Report Location: From the CorporatePass window, find the Corporate Pass records you wish to include in the report. select Share, then PDF and choose report Corporate Pass List from the list of available reports. Remember to select the appropriate background for this report then run the report. Use: Provides detailed breakdown of usage of Corporate Pass records, including invoices generated against each Corporate Pass. Report Location: From the Corporate Pass window, find the Corporate Pass records you wish to include in the report. select Share, then PDF and choose report Corporate Pass from the list of available reports. Remember to select the appropriate background for this report then run the report. Use: To obtain an overview of payments processed, declined or rejected, processed through either your office or over the website. 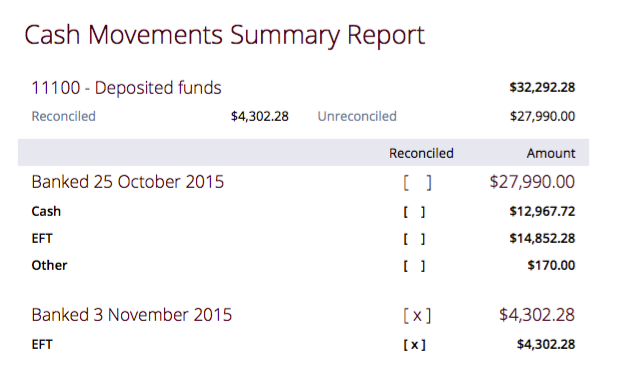 Report Location: From the Payment In window, find the payments you wish to include in the report. select Share, then PDF and Choose Report Payment In. Remember to select the appropriate background for this report then run the report. Report Notes: All payments made, or attempted, as part of the enrolment process will created a Payment In record. 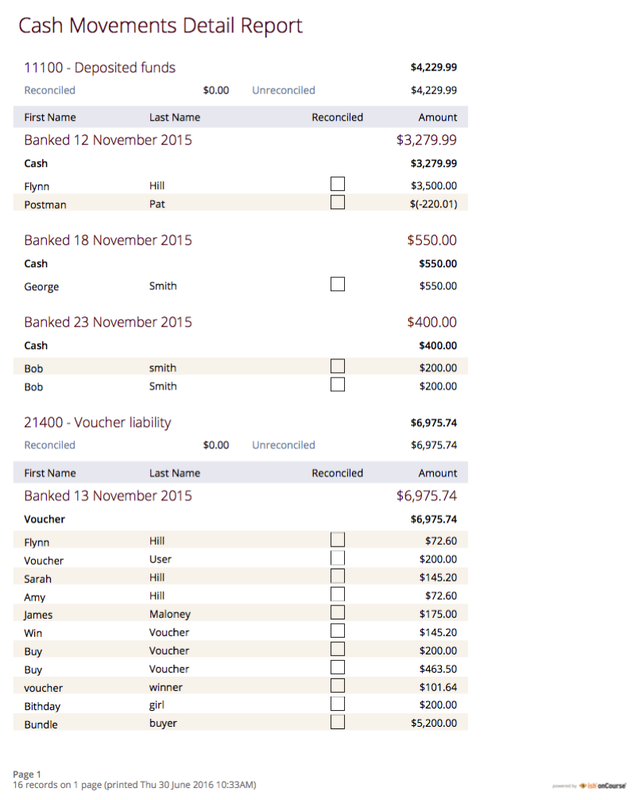 You can also manually create payments in from this window, against any outstanding invoice. Use: To obtain an overview of payments out processed. Report Location: From the Payment Out window, find the payments you wish to include in the report. select Share, then PDF and Choose Report Payment Out. Remember to select the appropriate background for this report then run the report. Use: To print a list of all transactions (both debits and credits) for a specified period of time for a particular contact. This is similar to a Statement report, but a date range can be defined and the date range will be printed in the report. 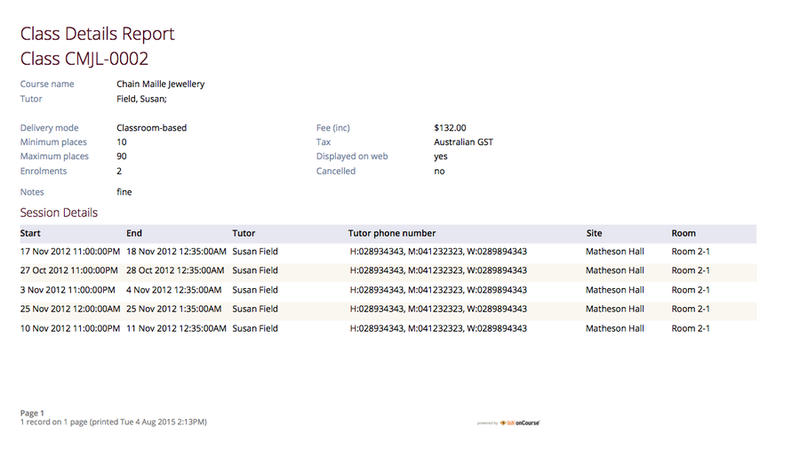 Report Location: From the Contact menu, Select Print and Choose Transaction Report, and define a date range. Remember to select the appropriate background for this report then run the report. Use: To provide a detailed report displaying transactions made to and from each general ledger account over a specified period of time. Report Location: You can access this report from Financial > Transactions or Financial > Accounts. Once in either "Transaction" or "Accounts" list view, select Share, then PDF then select Transaction Summary from the list of available reports. Be sure to adjust the date to suit your requirements. Generally this report is printed for one selected account at a time, but can be printed for all accounts as needed. Select the appropriate background for this report then run the report. You can also print this report from the contact window, to show the general ledger transactions from one or more selected contacts. Use: To provide a more general overview of transactions made over a specified period of time. This report is commonly printed each month and used to prepare a journal for import into the primary accounting system. 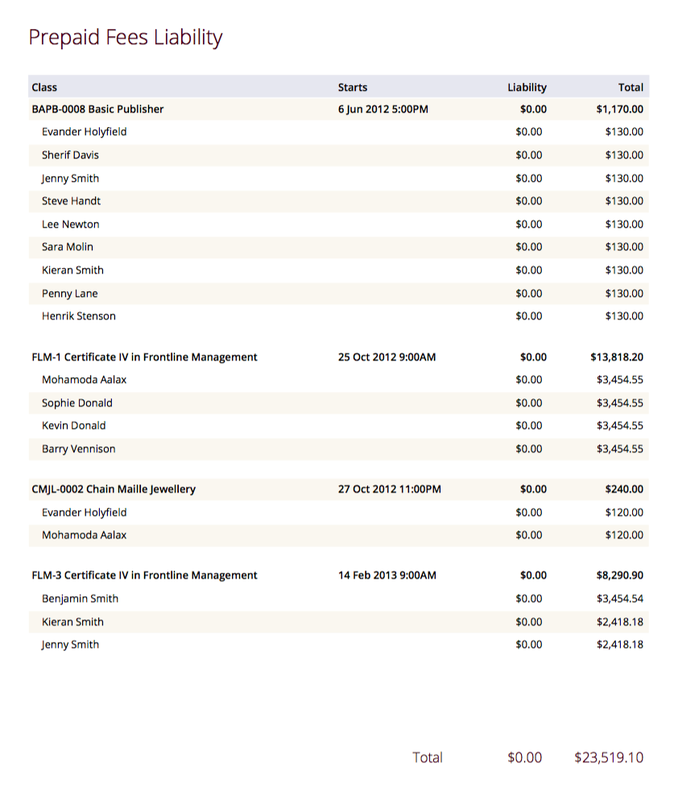 Report Location: You can access this report from Financial > Transactions or Financial > Accounts. Once in either "Transaction" or "Accounts" list view, select Share, then PDF then select Transaction Summary from the list of available reports. Be sure to adjust the date to suit your requirements. Generally this report is printed to include all displayed records. Select the appropriate background for this report then run the report. Use: To reconcile payment in/payment out lines. Report Location: From the Financial menu, Select Banking Deposits. Highlight the records you wish to reconcile, and then select Share, then PDF. 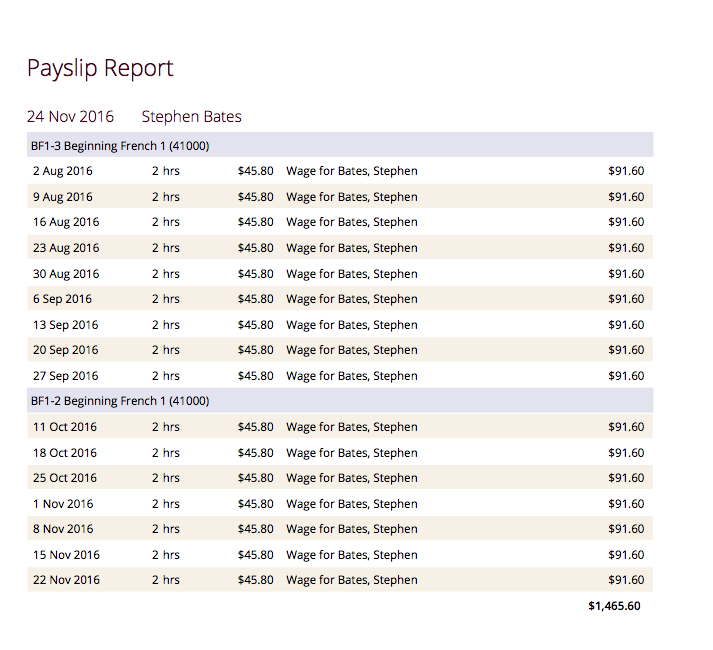 This report shows the detail for each payment in/payment out line and groups and total payments by type. Remember to select the appropriate background for this report then run the report. Report Location: From the Financial menu, Select Banking Deposits. Highlight the records you wish to reconcile, and then select Share, then PDF. 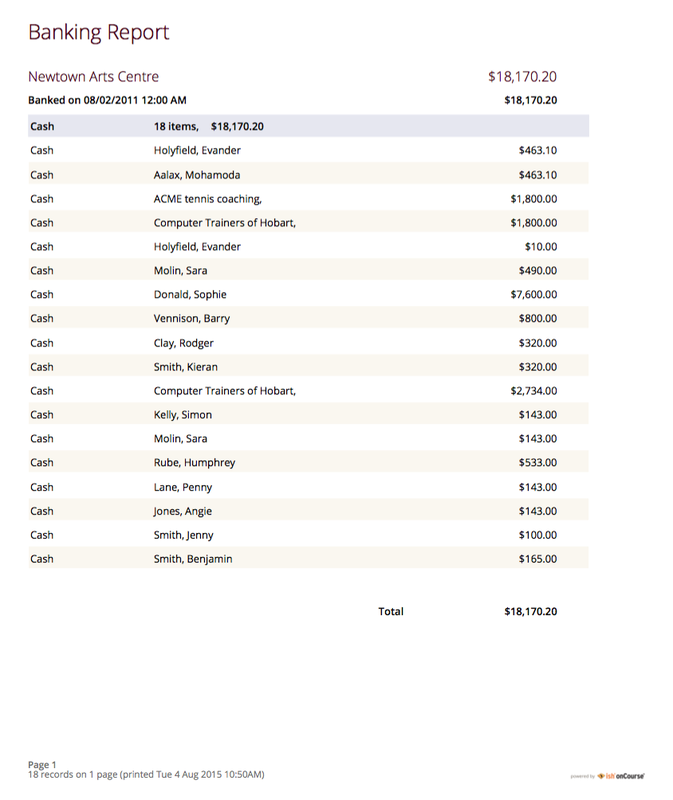 This report only shows the summary data and groups and total payments by type. Remember to select the appropriate background for this report then run the report. Use: To print a list of all transactions (both debits and credits) for a particular contact for all time, showing their opening and closing balances. Report Location: From the Contact menu, select Share, then PDF and Choose Statement. This report will print the entire transaction history. Remember to select the appropriate background for this report then run the report. Use: Report is generated at the conclusion of any non VET short courses to verify that the student attended all of the required number of classes. 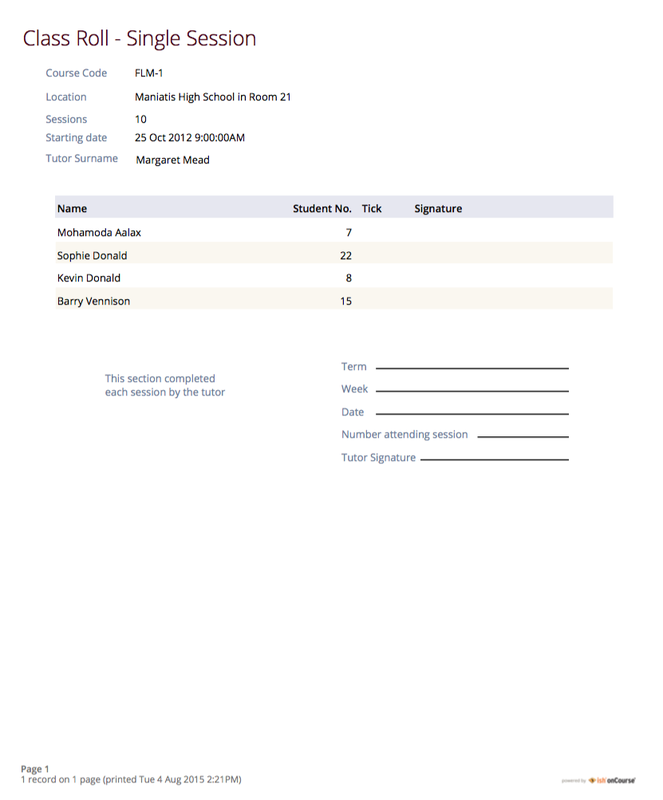 Report Location: From the Enrolment window, select the specific students you wish to print the certificates for. Select Share, then PDF and then choose Certificate Attendance Report from the drop down menu of reports. Remember to select the appropriate background for this report then run the report. Report Location: From the Student window, select the specific students you wish to print the transcripts for. 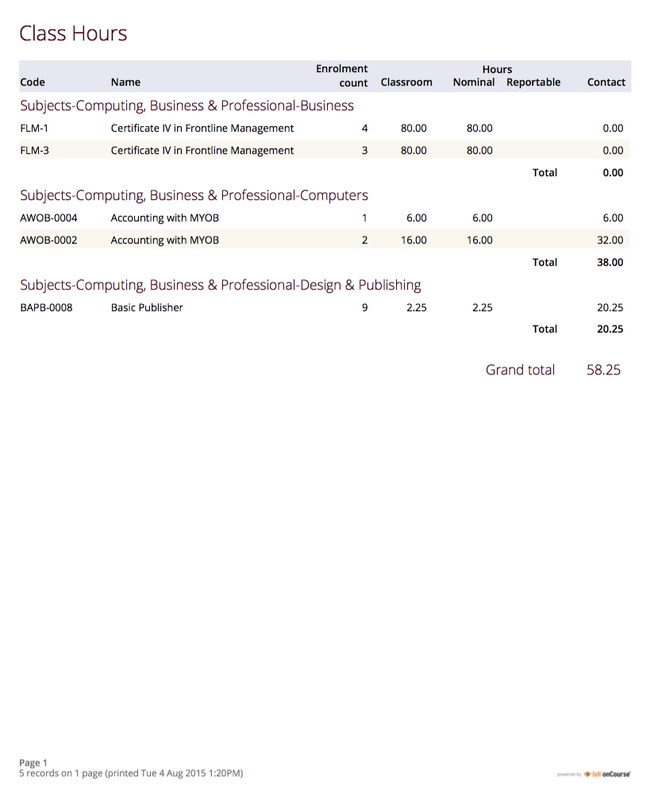 Select Share, then PDF and then choose Student Transcript from the drop down menu of reports. Remember to select the appropriate background for this report then run the report. Use: To obtain an overview of all classes status within a given time period, such as a term. Classes are grouped by their Category/Sub Category tag. Useful for holistic planning processes and work flow activities such as confirming course go ahead or managing cancellations. Report Location: From the Class window, find the classes you wish to include in the report, such as a particular date range. Select Share, then PDF and Choose report Class by Subject. Remember to select the appropriate background for this report then run the report. Report Notes: M/F column: If a student's gender is not set within their details, they will not counted for either M or F; thus M + F does not necessarily equal to the total number of enrolments. 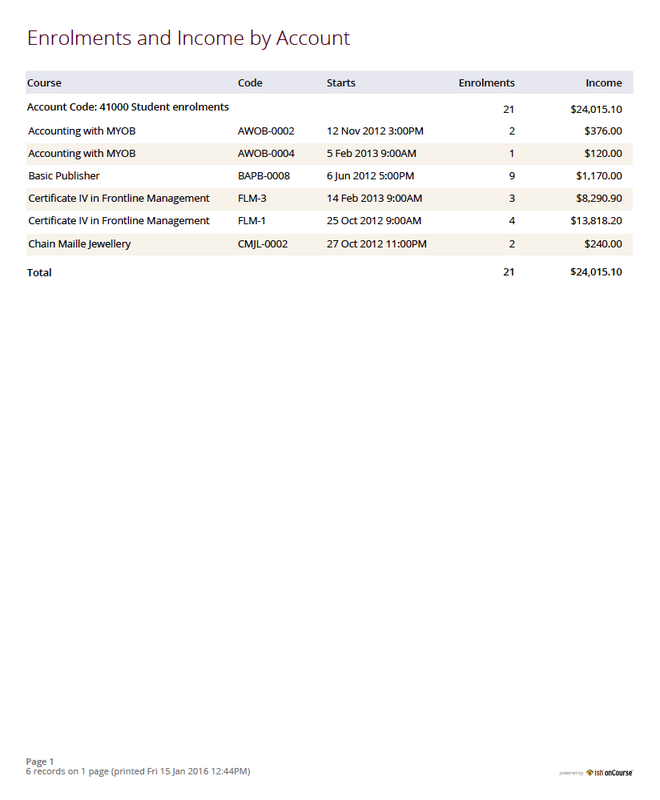 Target column: This is the number of enrolments to reach the target for this class, i.e. : -3 means 3 more enrolments are required to meet the target, 3 would means that there are 3 enrolments more than the target. 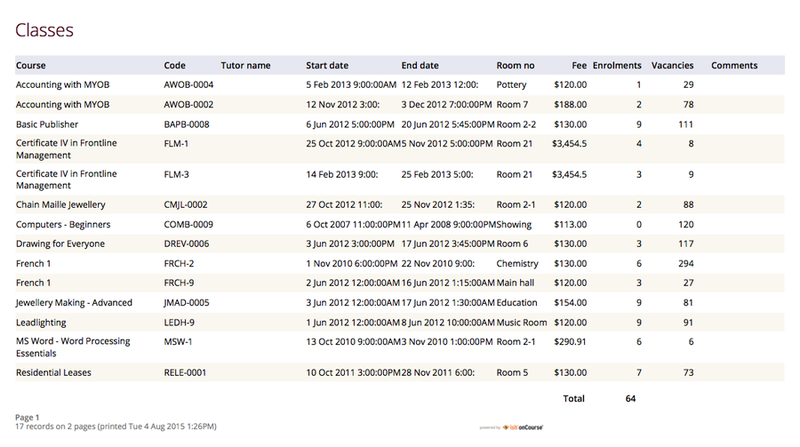 Use: To keep track of delivery of funded program Student Contact Hours over a particular time period. 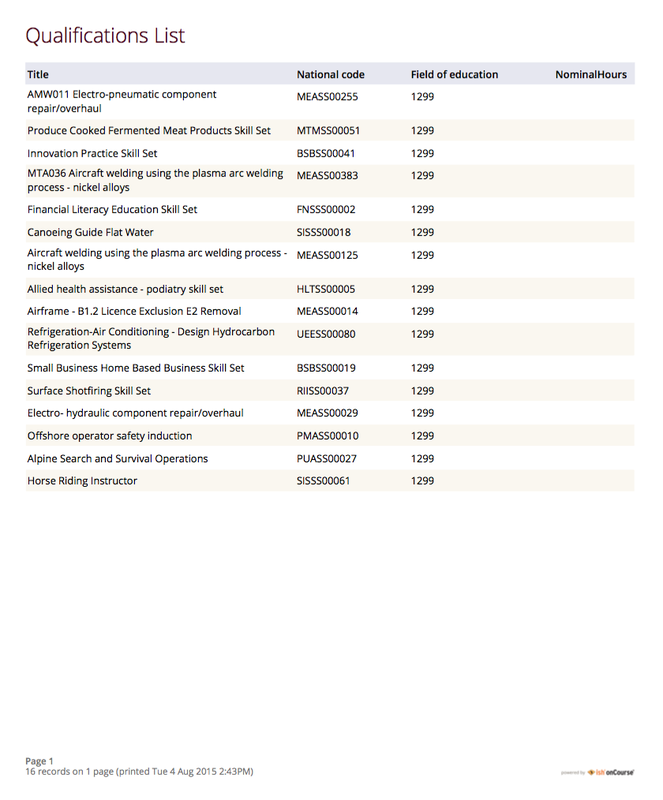 This report shows a summary of each qualification and the hours delivered against each of the national funding types. Report Location:From the Class window, find the classes you wish to include in the report, such as the current years English classes. Select Share, then PDF and choose report Class Funding. Remember to select the appropriate background for this report then run the report. Use: A summary of the classroom, nominal and reportable hours for each class, for use in the administration of VET / AVETMISS courses. 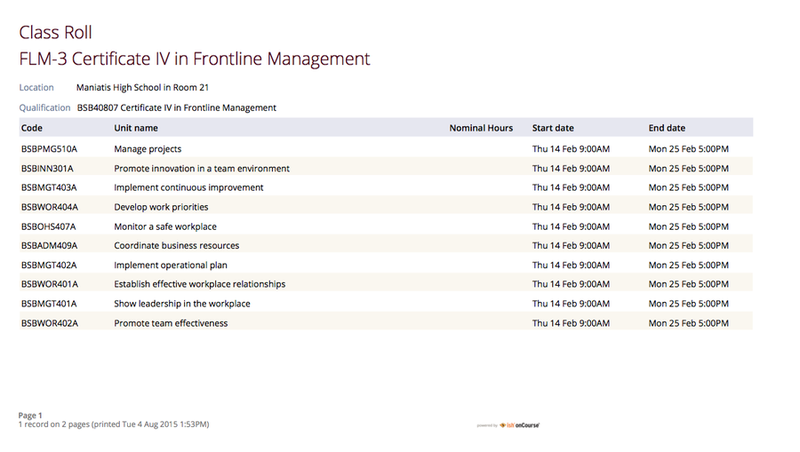 Report Location: From the Class window, select the classes you wish to track hours for. Select Share, then PDF and then choose Class Hours from the drop down menu of reports. Remember to select the appropriate background for this report then run the report. Use: This report provides a comparative analysis of sales figures (shown as number of enrolments and monetary value) from one College site to the next. Report Location: From the Enrolment window, select the specific enrolments and classes you wish to run the analysis for. Select Share, then PDF and then choose Sales Report from the drop down menu of reports. Remember to select the appropriate background for this report then run the report. Use: Provides a summary list of the number of enrolments and monetary value of sales for each site, with further detail regarding number of enrolments and monetary value listed by Course. 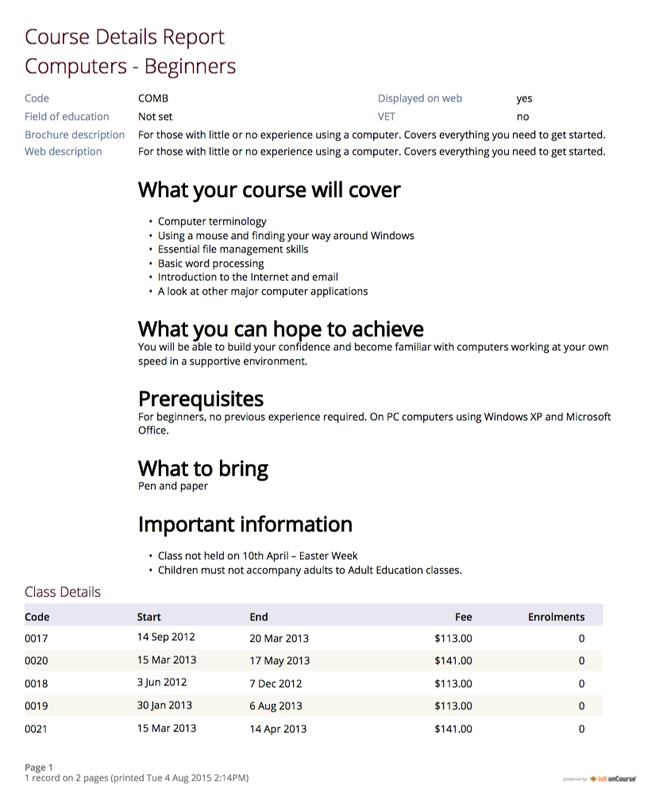 Report Location: From the Classes window, select the specific enrolments and classes you wish to run the analysis for. Select Share, then PDF and then choose Sales by Course Location Report from the drop down menu of reports. Remember to select the appropriate background for this report then run the report. Use: Provides a summary list of the number of enrolments and monetary value of those enrolments for classes which have been cancelled and the students transferred, refunded or credited. This report can be useful for deciding if that type of class should be offered in the future, based on it's level of previous student enrolment. Report Location: From the Classes window, select the specific classes you wish to run the analysis for. This report only prints data from classes which have a cancelled status. Select Share, then PDF and then choose Cancelled Classes Count from the drop down menu of reports. Remember to select the appropriate background for this report then run the report. 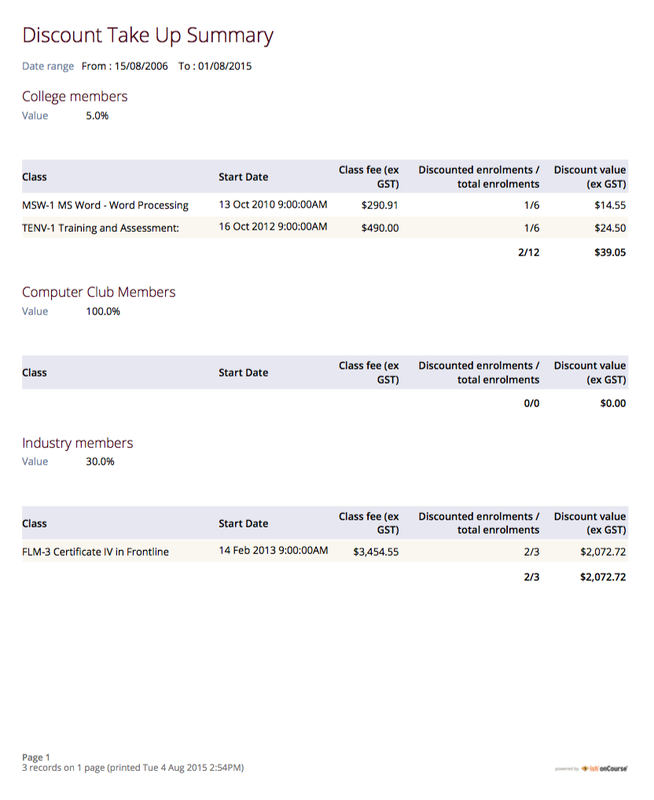 Use: Report generates a list of all discounts that apply to a given Class. As well as a summary of the number of enrolments and the discounts taken up. Report Location: From the Classeswindow, highlight the specific Classes you wish to run the report for. 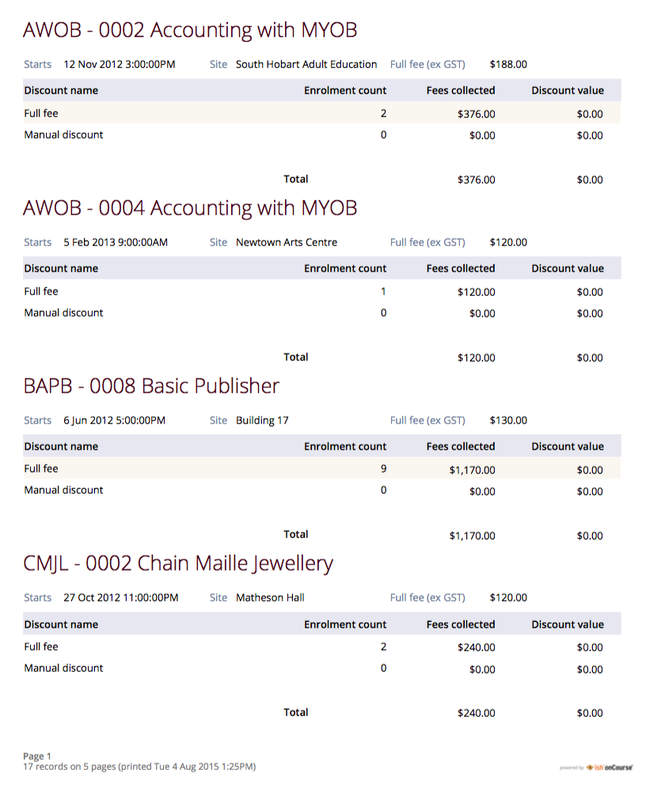 Select Share, then PDF and then choose the Discounts By Classfrom the drop down menu of reports. Remember to select the appropriate background for this report then run the report. Use: To obtain an overview of all classes status within a given time period, such as a term. 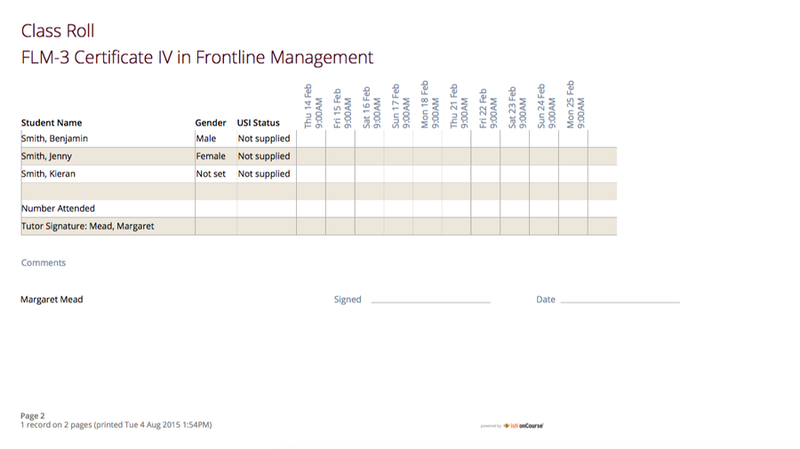 Useful for holistic planning processes and work flow activities such as confirming course go ahead or managing cancellations. Classes are reported in the list order you have sorted the window data e.g. 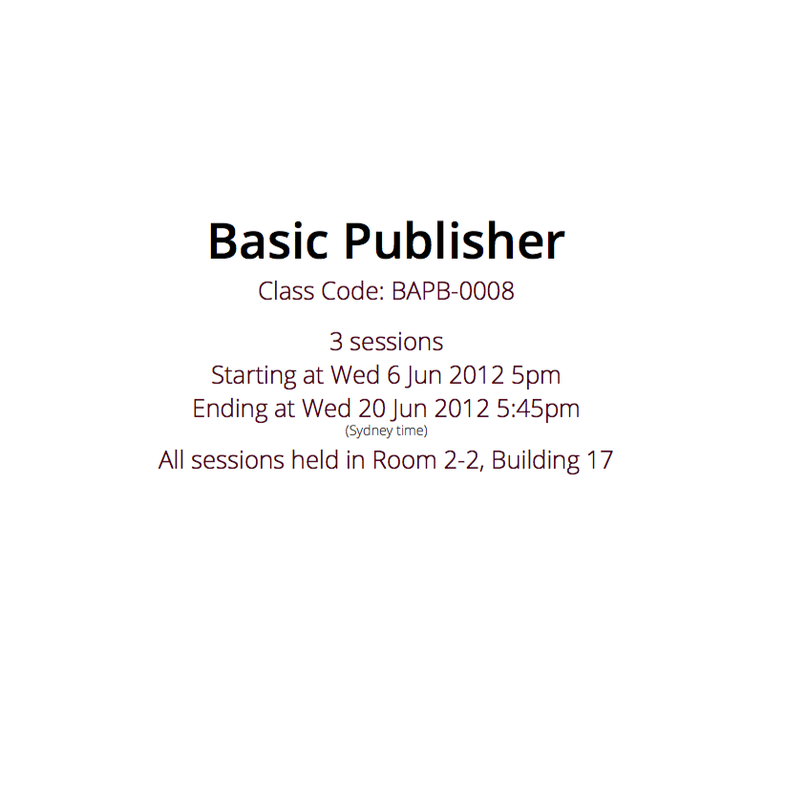 class name alphabetical order, start date order or code order. Report Location: From the Class window, find the courses you wish to include in the report, such as a particular date range. Select Share, then PDF and choose report Classes. Remember to select the appropriate background for this report then run the report. Report Notes: The information available in this report is also available grouped by subjects in the Classes by Subject Report. Report Location: From the Course window, find the courses you wish to include in the report, such as all courses tagged as 'business'. Select Share, then PDF and choose report Course List. Remember to select the appropriate background for this report then run the report. Use: Detailed report of all information for a given class, including delivery mode, minimum and maximum places, enrolment numbers, fees and discounts, session details, course description, tutor information and directions for getting to the campus. Report Location: From the Class window, select the specific classes you wish to print the details for. Select Share, then PDF and then choose Class Details from the drop down menu. Remember to select the appropriate background for this report then run the report. Reference for students requiring assistance. 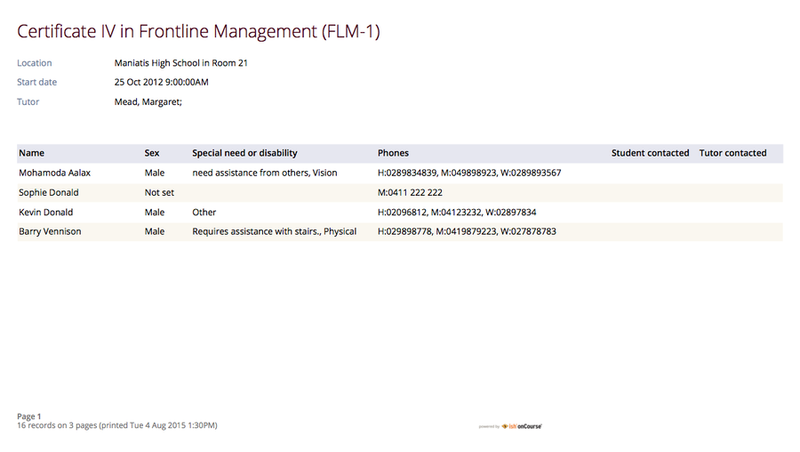 Use: Used as a reference for any special needs such as wheelchair access, dietary requirements and provides an indicator as to whether the student and or tutor has been contacted to confirm or follow up this information. Report Location: From the Class window, select the specific classes you wish to print the details for. Select Share, then PDF and then choose Student Special Needs Report from the drop down menu of reports. Remember to select the appropriate background for this report then run the report. Use: This report provides a list of all current and future classes assigned to a given site. Information includes, course and class name and code, start and end date, fee charged, enrolments (against target) and statistics on Male Female breakdown. Report Location: From the Class window, select the specific classes you wish to print the details for. Select Share, then PDF and then choose Class By Site from the drop down menu. Remember to select the appropriate background for this report then run the report. onCourse Room information by site. 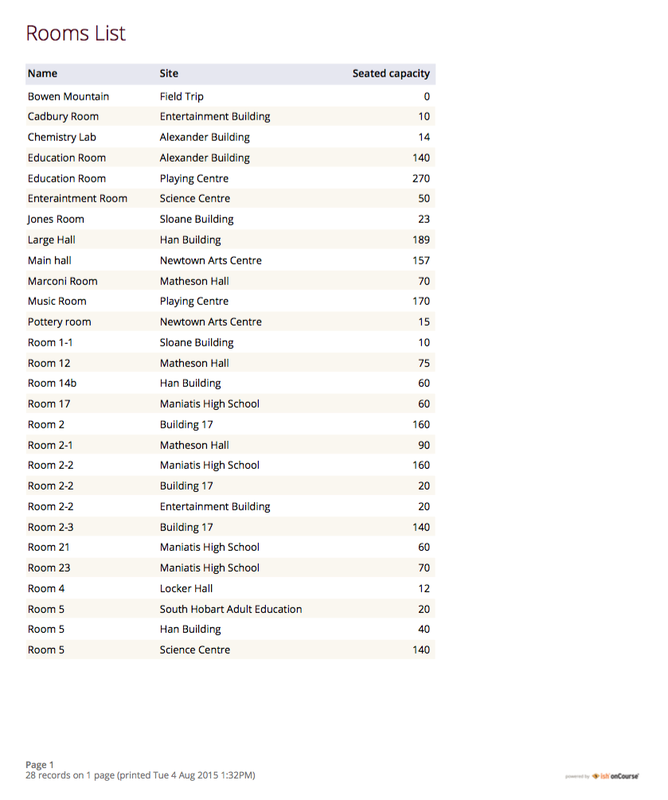 Use: List of all rooms and their related sites and seating capacity. 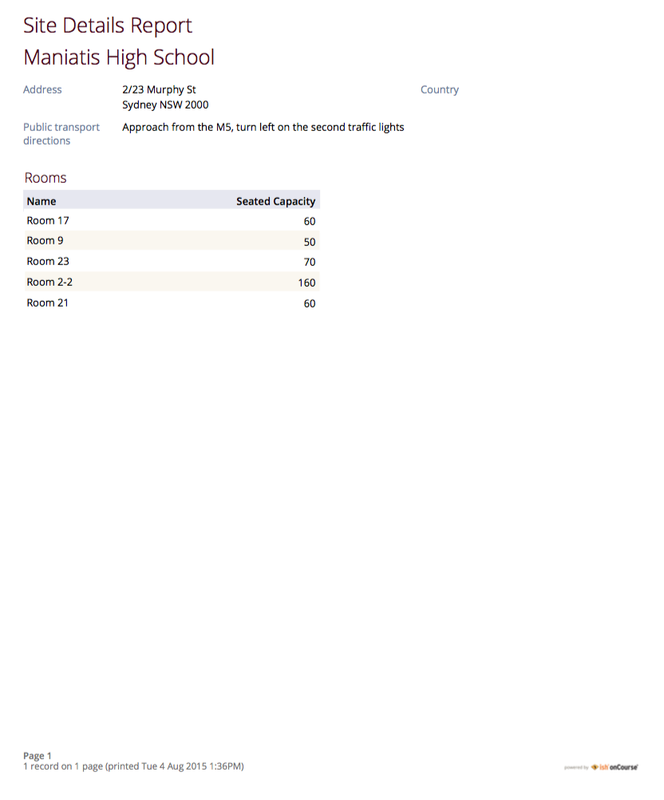 Report Location: From the Rooms window, select the specific rooms you wish to print the details for. Select Share, then PDF and then choose Rooms List from the drop down menu of reports. Remember to select the appropriate background for this report then run the report. 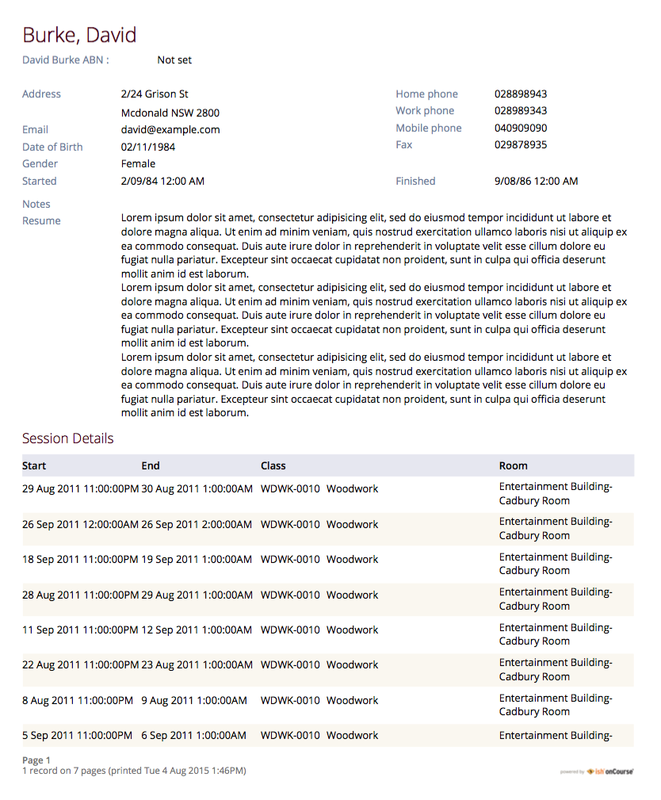 Use: The purpose of the report is to allow users to print the details of all sessions that are scheduled for a particular room, for a particular date range. Report Location: From the "room" window, highlight the room in question and go to Share, then PDF choose "Room timetable" from the drop down menu in the top right hand side. Remember to select the appropriate background for this report then run the report. In the example below, there are some classes with and without tutors, to give you an idea of how it will come out for you. 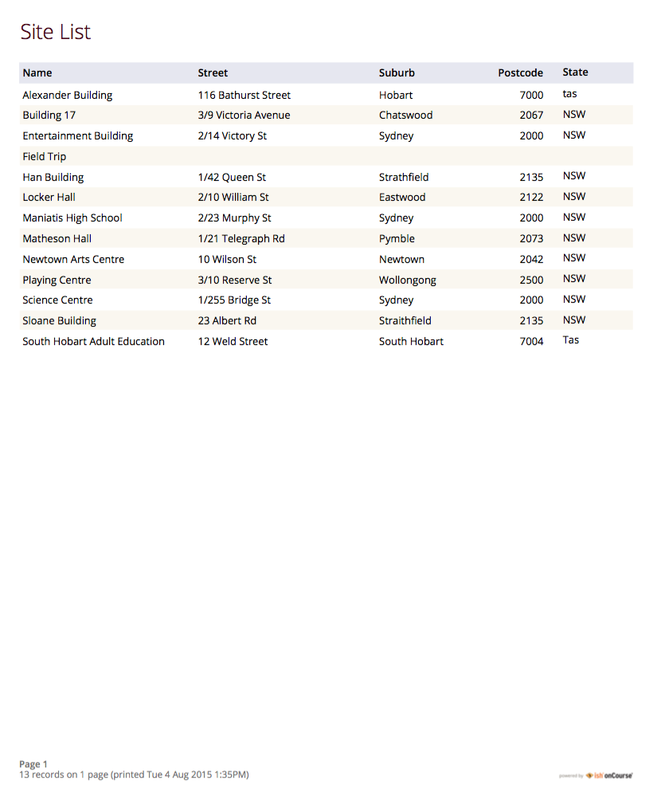 Use: List of all Tutors by Class, including site information and start end times for sessions. Report Location: From the Class window, select the specific details you wish to print the details for. Select Share, then PDF and then choose Class Tutor List Report from the drop down menu of reports. Remember to select the appropriate background for this report then run the report. 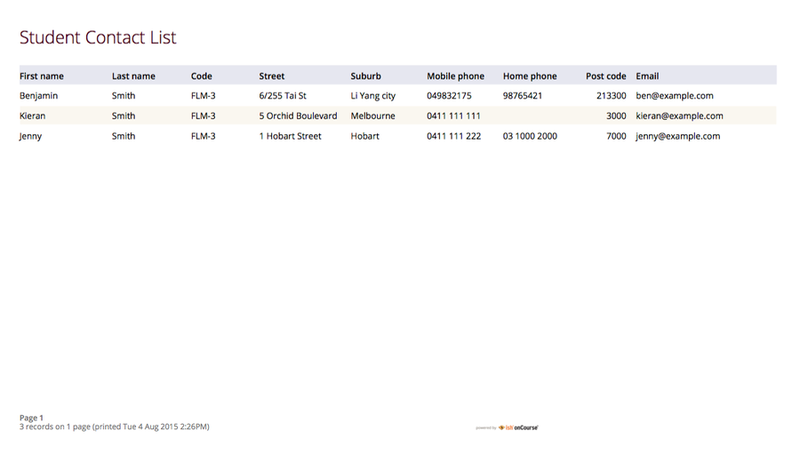 Report Location: From the Site window, select the specific records you wish to print the details for. Select Share, then PDF and then choose Site List from the drop down menu of reports. Remember to select the appropriate background for this report then run the report. Report Location: From the Site window, select the specific records you wish to print the details for. Select Share, then PDF and then choose Site Details from the drop down menu of reports. Remember to select the appropriate background for this report then run the report. Report Location: From the Tutor window select the Tutor(s) you wish to view the details for. Select Share, then PDF and choose the Report entitled Tutor Details. Remember to select the appropriate background for this report then run the report. Report Location: From the Tutor window select the Tutors you wish to view the details for. Select Share, then PDF and choose the Report entitled Tutors. Remember to select the appropriate background for this report then run the report. Report Location: From the Class window select the specified classes you wish to print details for. 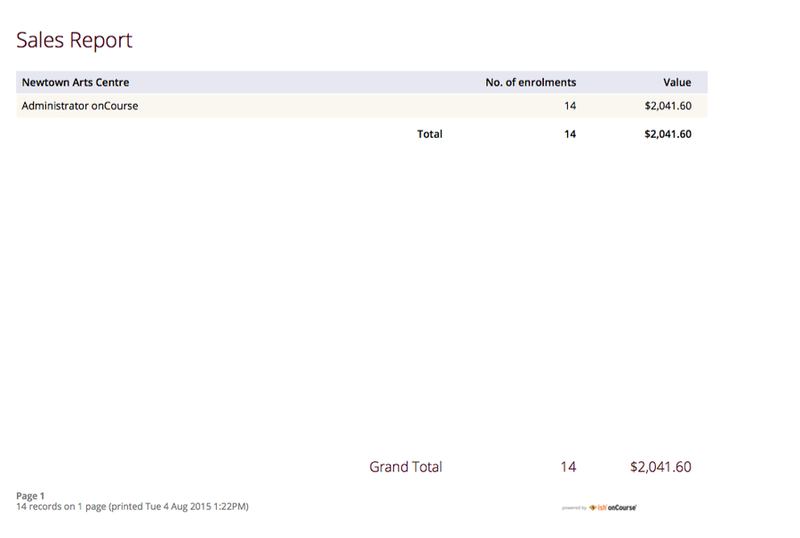 Select Share, then PDF and then choose Enrolment Summary By State Report from the drop down menu. Remember to select the appropriate background for this report then run the report. Report Location: From the Class window select the specified classes you wish to print details for. Select Share, then PDF and then choose Class Roll - Age from the drop down menu. Remember to select the appropriate background for this report then run the report. Report Location: From the Class window select the specified classes you wish to print details for. Select Share, then PDF and then choose Class Roll - USI from the drop down menu. Remember to select the appropriate background for this report then run the report. Report Location: From the Class window select the specified classes you wish to print details for. Select Share, then PDF and then choose Class Sign For Door Report from the drop down menu. Remember to select the appropriate background for this report then run the report. Use: Contact details (first name, last name, email) of all people on a given mailing list. Report Location: From the Class or Contact window, select the contacts you wish to run the report against. Select Share, then PDF and choose the Mailing List ExportReport. Remember to select the appropriate background for this report then run the report. Use: List of all current wait list entries, including name of course, name of student, client, and site where course is held. Report Location: From the Wait List window, select the specific entries you wish to print the details for. Select Share, then PDF and then choose Wait List Reportfrom the drop down menu of reports. Remember to select the appropriate background for this report then run the report. Report Location: From the Classes window, select the specific classes you wish to include in the report. Select Share, then PDF and then choose Total Discountsfrom the drop down menu of reports. Remember to select the appropriate background for this report then run the report. Use:To obtain full list of one or more classes scheduled sessions. 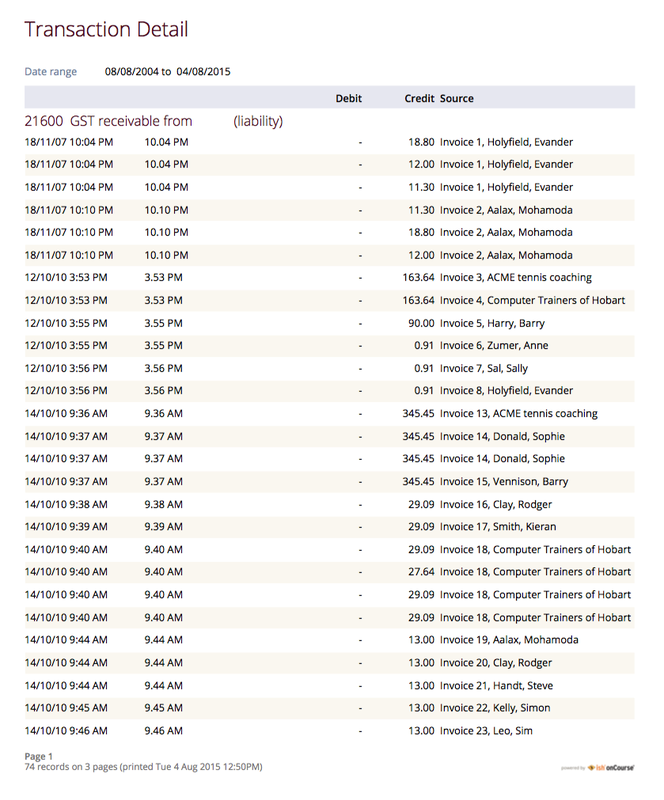 This is a list view of the timetabled sessions. Useful information to provide to venue coordinators, tutors and students. Report Location: From the Class window, find the classes you wish to include in the report, such as all current classes at a particular venue. Select Share, then PDF and Choose Report Class Details. Remember to select the appropriate background for this report then run the report. 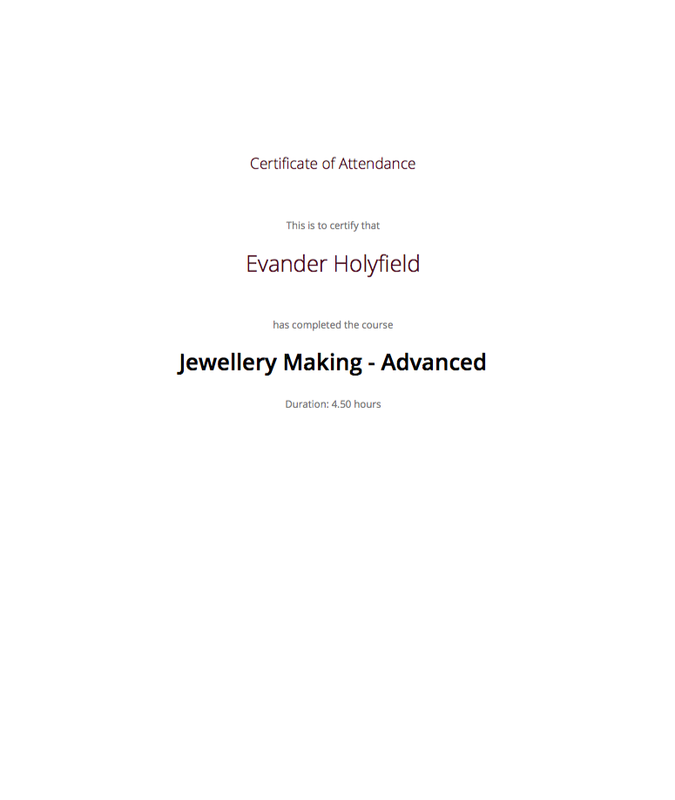 Use: To create a print out of the full course information including scheduled classes. Can be used to create print copies of all the web information to mail to students without web access. Report Location: From the Course window, find the course(s) you wish to include in the report, such as all courses tagged as 'sport and fitness'. Select Share, then PDF and Choose Report Course Details. Remember to select the appropriate background for this report then run the report. Use: To provide students with details of their class once they have enrolled. Report Location: From the Enrolment window, select the enrolments you wish to print enrolment confirmations for, Choose Share, then PDF and Select the Report Enrolment Confirmation. Remember to select the appropriate background for this report then run the report. Report Notes: During the enrolment process, if the student provides an email address, an email confirmation of enrolment can be selected. It is not necessary to provide hard copy enrolment confirmations for these students. 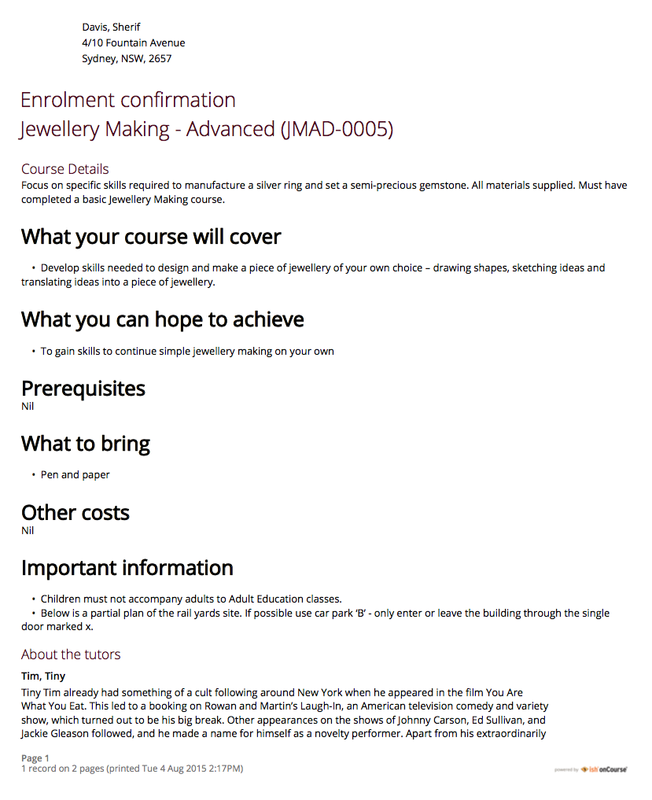 Use: Class information that can be provided for the enrolling student including course details, information about the Tutor, directions on where to go and the individual session details. Report Location: From the Class window, select the specific classes you wish to print the details for. Select Share, then PDF and then choose Class Information from the drop down menu of reports. Remember to select the appropriate background for this report then run the report. 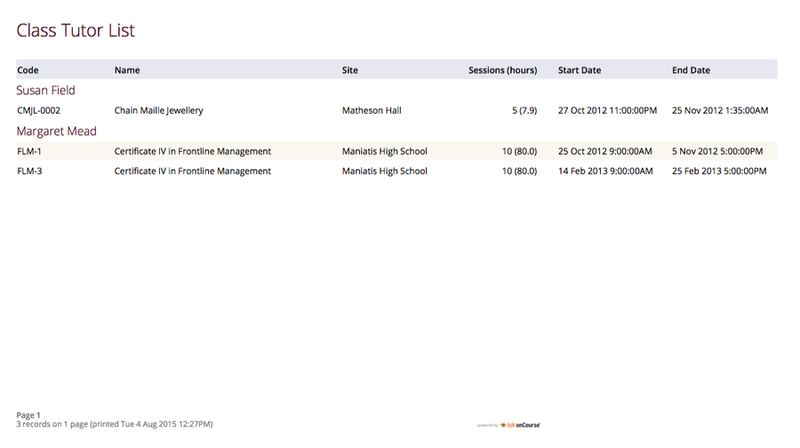 Use: To create a list of students enrolled and columns for each of the scheduled sessions, used to mark attendance. The report will automatically re-size to fit the number of students and session conditions. Hard copy rolls are often distributed to tutors before classes commence, or PDF copies emailed to tutors or coordinators. Report Location: From the Class window, find the classes you wish to include in the report, such as all current class taught by a particular tutor. Select Share, then PDF and Choose Report Class Roll. Remember to select the appropriate background for this report then run the report. Report Notes: Given that tutors may pass rolls around the room for students to initial their attendance, to comply with privacy legislation, there are no student contact details on the class roll. If the tutor requires the student's contact details, a student contact list can be printed. The roll is marked by session and will show "Y" if attended; partial attendance, "N" for absent; absent without reason and no value for unmarked attendance. Use: To be used for classes where the tutors need to return a student-signed copy of the class roll back to the college administration office after each week or session. Users need to print multiple copies of this roll if they require one for each session of a class. 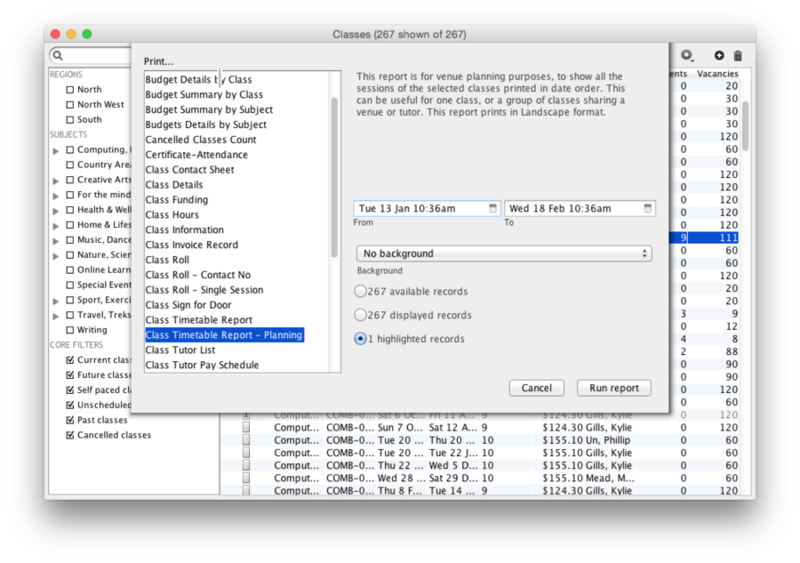 Report location: From the Class window and highlight the records you wish to print a Class Roll for. Go to Share, then PDF and then select Class Roll Single Sessionfrom the drop down list of available reports. Remember to select the appropriate background for this report then run the report. Report Location: From the Classwindow, select the Class you wish to generate an attendance sheet for. Go to Share, then PDF and then select Simple Class Rollfrom the drop down menu of available reports. Remember to select the appropriate background for this report then run the report. Use: The purpose of this report is to allow the user to select multiple classes (which may contain the same students e.g. those doing a Diploma may undertake 4 classes simultaneously) and print a date-range specified timetable of sessions to show the students when and where to turn up to class. Useful for both students attending classes or could also be printed for all classes for a tutor who teaches multiple classes. Report location: To print this report go to the Class window and highlight the class(es) you wish to run the report against. Go to Share, then PDF and then select Class Timetable Report from the drop down list of available reports. Remember to specify the date range and select the appropriate background for this report then run the report. Use: This is an alternate version of the class timetable report which includes the session private notes field in the last column. Report location: To print this report go to the Class window and highlight the class(es) you wish to run the report against. 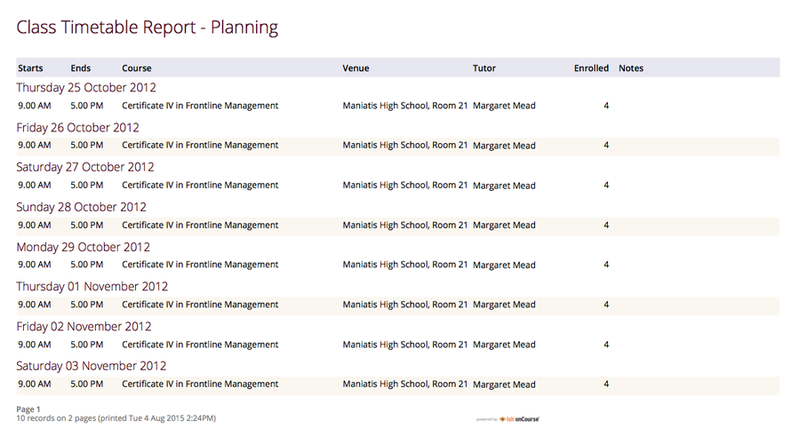 Go to Share, then PDF and then select Class Timetable Report - Planning from the drop down list of available reports. Remember to specify the date range and select the appropriate background for this report then run the report. Use: To create a list of students enrolled and the phone numbers and email addresses for those students. Hard copy lists can be distributed to tutors before classes commence if you wish them to have this information. Tutors can also access this information via their web portal if you organisation has enabled it. Report Location: From the "Class" window, find the classes you wish to include in the report, such as all current class taught by a particular tutor. Select Share, then PDF and Choose Report"'Class Contact List". Remember to select the appropriate background for this report then run the report. Report Notes: Given that tutors may pass rolls around the room for students to initial their attendance, to comply with privacy legislation, there are no student contact details on the class roll. If the tutor requires the student's contact details, a student contact list can be printed. Use: To export the contact details provided for students enrolled in a class. Report Location: From the Class window, find the classes you wish to include in the report, such as all current class taught by a particular tutor. Select Share, then PDF and Choose Report Student Contact List. Remember to select the appropriate background for this report then run the report. Use: A useful educational report showing an overview of all units a student has undertaken at the training organisation and their outcomes. 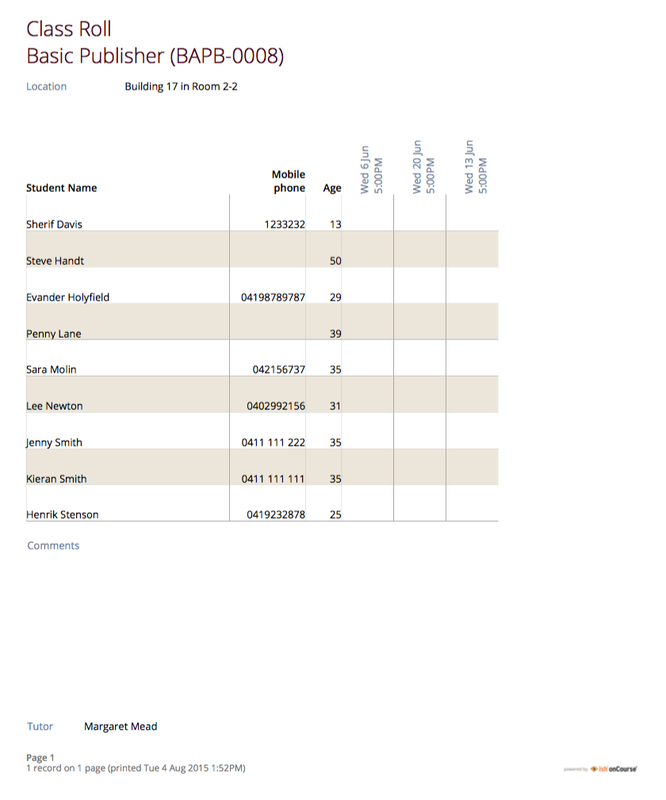 Report Location: From the Contacts window, select the classes and students you wish to include in the report. Select Share, then PDF and choose Student Details from the drop down menu of reports. Remember to select the appropriate background for this report then run the report. Use: Report that provides a list of all students, their contact phone number, can be printed out and used for a roll call. Can also be used to contact students who are not in attendance at their enrolled session or class. Report Location: From the Class window, select the specific classes you wish to print the details for. Select Share, then PDF and then choose Class Roll - Contact No from the drop down menu of reports. Remember to select the appropriate background for this report then run the report. Use: For use by the College Tutor to mark the assessment outcomes for each student studying a VET class. As well as enabling the Tutor to sign and date the entries prior to sending back to College Administrators for entering onto onCourse. Report Location: From the Class window, select the specific classes you wish to print the required assessment outcomes for. 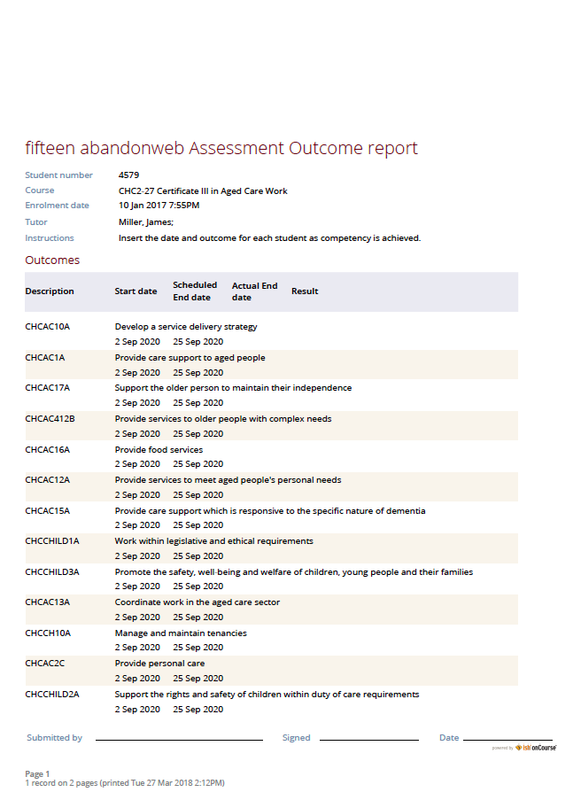 Select Share, then PDF and choose the Assessment Outcomes Report from the drop down menu. The list of students names are sorted alphabetical by last name. Remember to select the appropriate background for this report then run the report. Use: For use by the College Tutor to mark the assessment outcomes for a student studying a VET class, as well as enabling the Tutor to sign and date the entries prior to sending back to College Administrators for entering onto onCourse. Report Location: From the Enrolment window, select the specific enrolments. 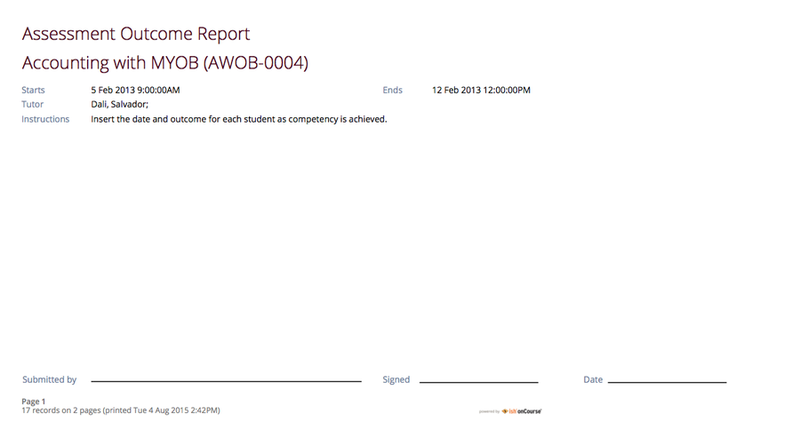 Select Share, then PDF and choose the Assessment Outcomes Per Student Report from the drop down menu. Remember to select the appropriate background for this report then run the report. Use: A list of the all the data downloaded from NTIS which you can use to start building courses. Report Location: From the Qualifications window, select the qualifications you wish to run the report against. Select Share, then PDF and choose the Qualifications Report. Remember to select the appropriate background for this report then run the report. Use: onCourse includes AQF recommended templates for full Qualification Certificates, Statements of Attainment and transcripts. 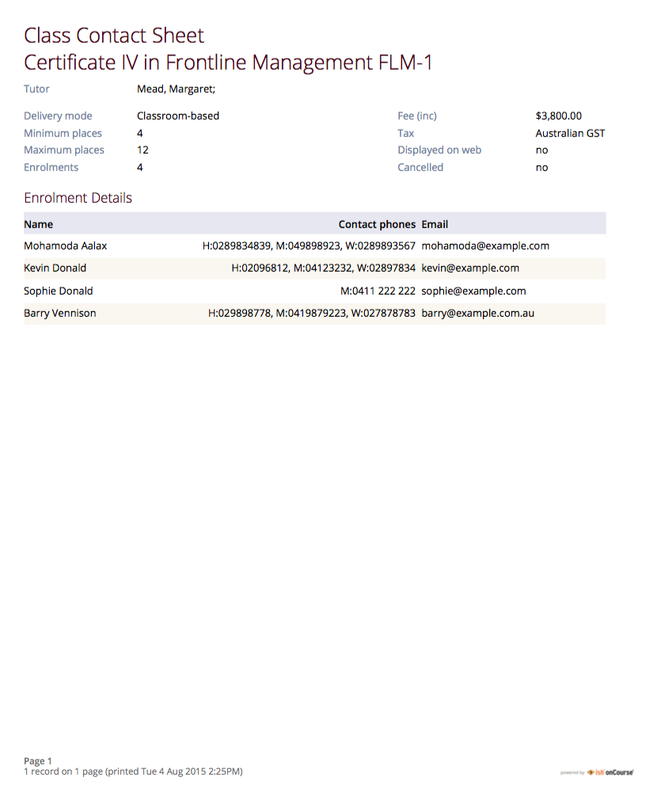 Certificates can only be generated from units that are recorded as part of onCourse enrolments. If you wish to include Credit Transfer units, you will need to add these outcomes to the students record before you create the certificate. For detailed information regarding VET Certificates, refer to the RTO Guide Chapter of the User Manual. Report Location: From the Certificate window, select the student(s) you wish to print certificates for. Select Share, then PDF and choose the Certificate from the drop down menu of reports. Remember to select the appropriate background for this report then run the report. Report Notes: The resulting report (Statement of Attainment or Qualification) is dependent on how you have set up the Certificate record. If you have more units in the Statement than will fit on a single page, the report will automatically break into two pages. Report Location: From the Certificate window, select the student(s) you wish to run certificates for. Select Share, then PDF and choose the Certificate from the drop down menu of reports. Remember to select the appropriate background for this report then run the report. Report Notes: The resulting report (Statement of Attainment or Qualification) is dependent on how you have set up the Certificate record. Use: onCourse includes AQF recommended templates for full Qualification Certificates, Statements of Attainment and transcripts. Certificates can only be generated from units that are recorded as part of onCourse enrolments. If you wish to include Credit Transfer units, you will need to add these outcomes to the students record before you create the certificate. For detailed information regarding VET Certificates, refer to the RTO Guide Chapter of the User Manual. 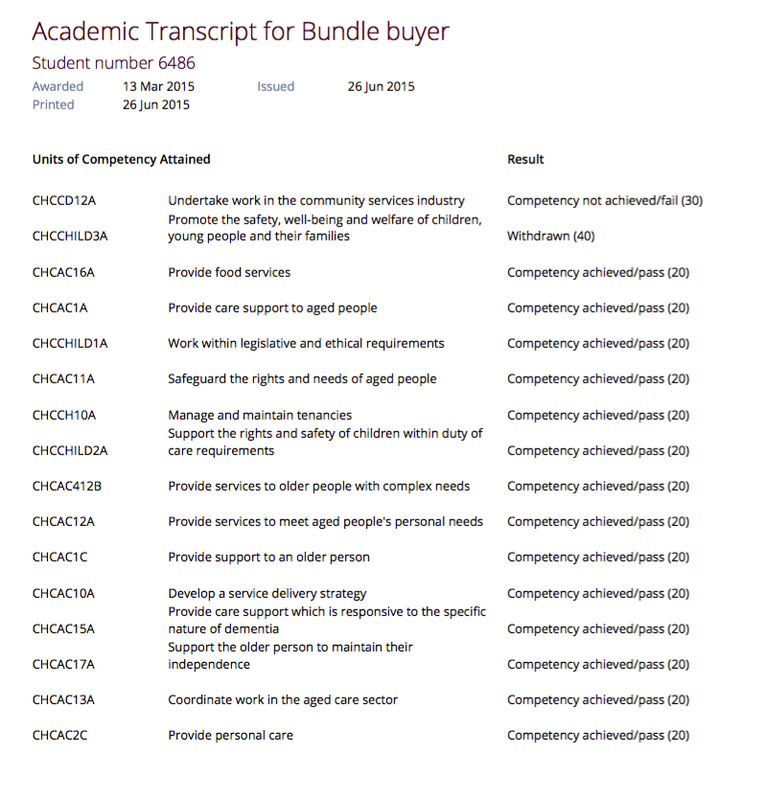 The Transcript report can be printed as required from the Certificate window for all types of certificate records. Report Location: From the Certificate window, select the student(s) you wish to run certificates for. 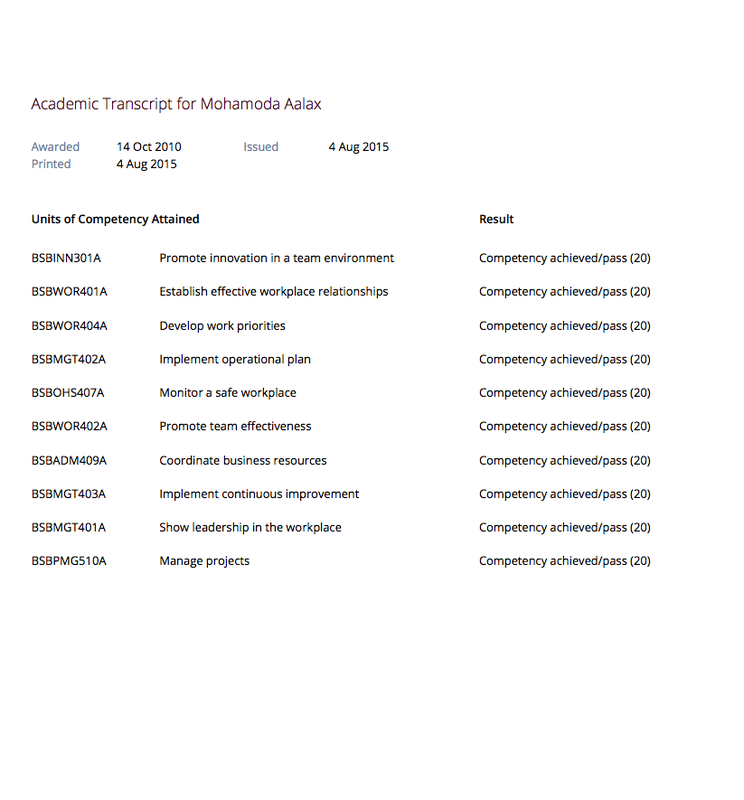 Select Share, then PDF and choose the Transcript from the drop down menu of reports. Remember to select the appropriate background for this report then run the report. 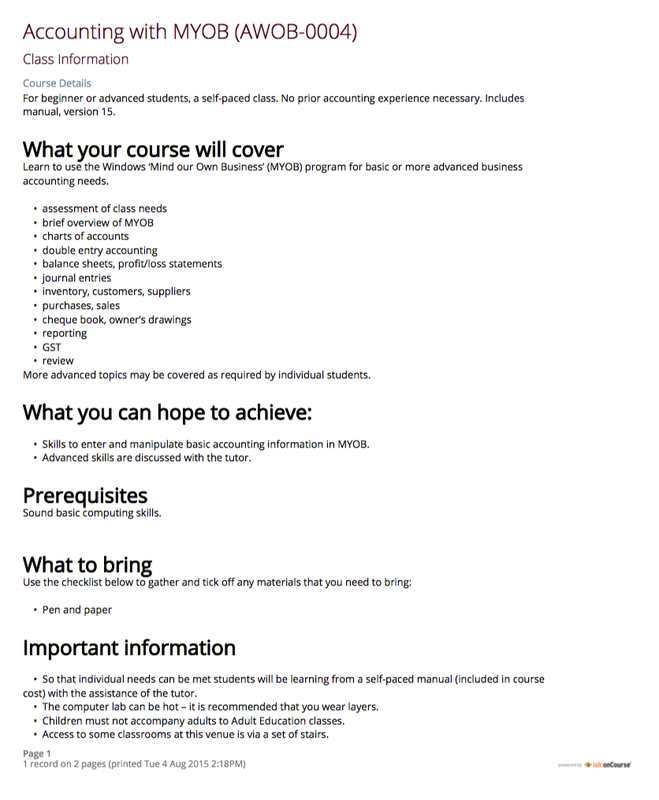 Use: A list of all Training Packages available within onCourse. Report Location: This report is accessible via the Courses menu, Share, then PDF then Training Packages. Remember to select the appropriate background for this report then run the report. 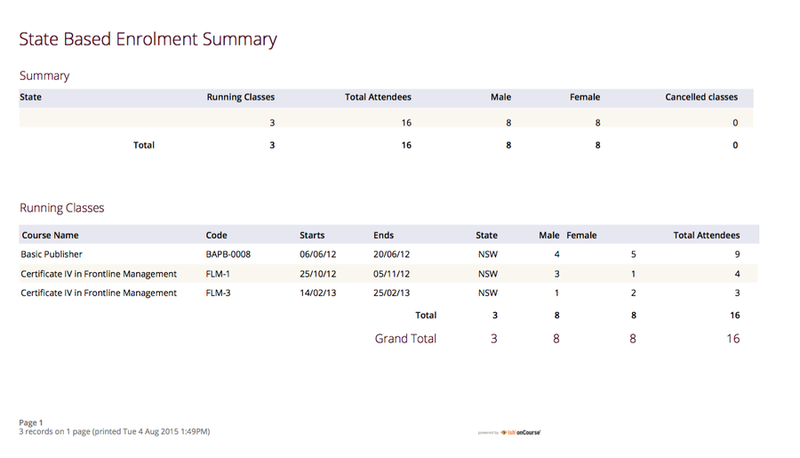 Report Location: From the Enrolment window, select the specific students you wish to run the training plan for. 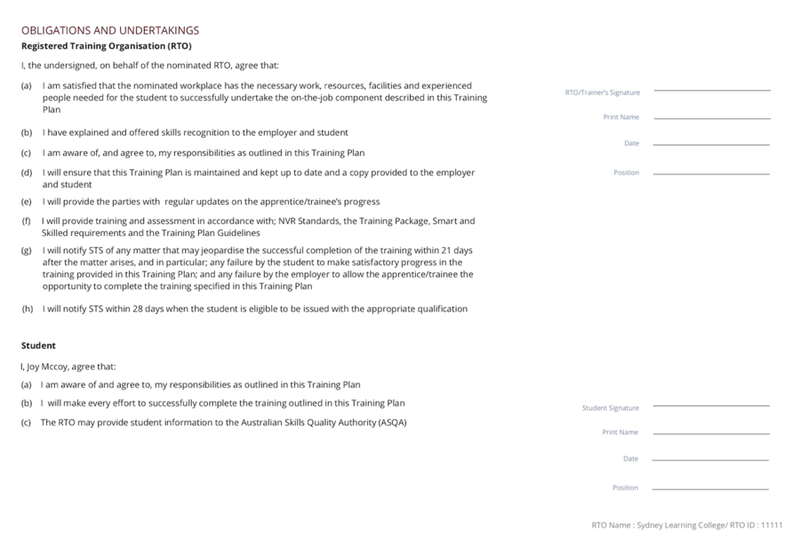 Select Share, then PDF and then choose Traineeship Training Plan from the drop down menu of reports. Remember to select the appropriate background for this report then run the report. Report Location: From the Classwindow, select the Classes you wish to generate Training Plansfor. Go to Share, then PDF and then select Training Planfrom the drop down list of available reports. Remember to select the appropriate background for this report then run the report. 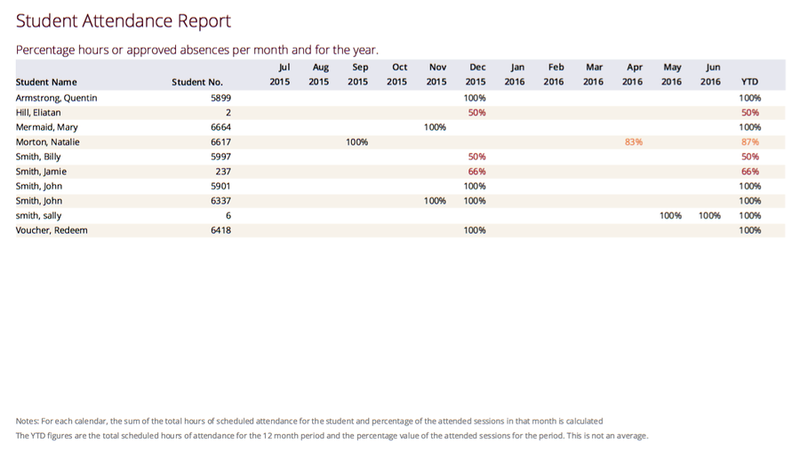 Use: This reports allows you to calculate monthly student attendance averages, of particular use to CRICOS providers. Report Location: This report is available from the contact window, but generally you would start from the classes window, select a group of classes, and using the find related icon, find 'enrolled students'. 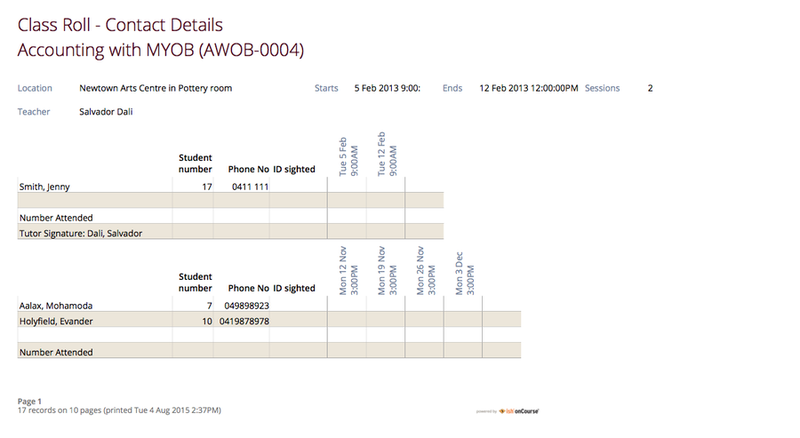 Then from the Contact list view, select the Students you wish to generate theStudent Attendance Averagesfor. Go to Share, then PDF and then select Student Attendance Averagesfrom the drop down list of available reports. Remember to select the appropriate background for this report then run the report. Use: To report on the opening, closing and movement of the onCourse chart of accounts during the time frame you define. 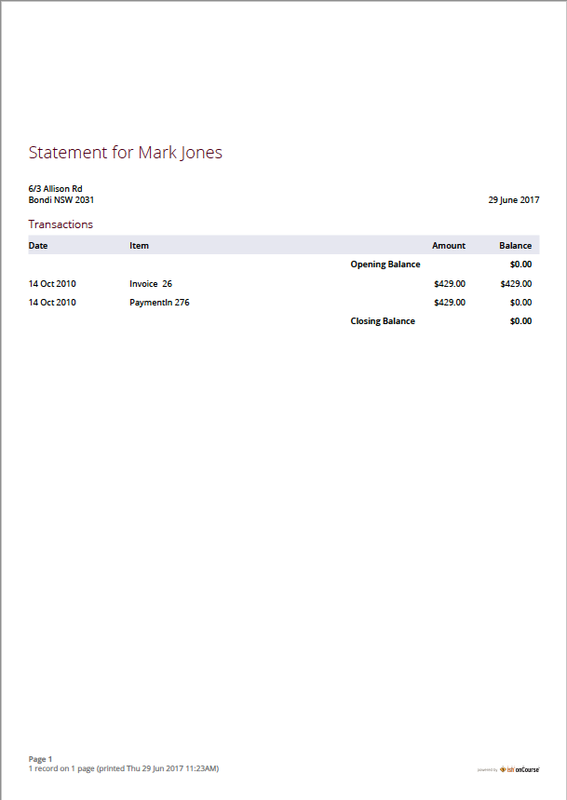 It shows a summary of the credits and debits in each account, which will indicate if there is a error in the ledger should the accounts not balance. Note that onCourse may not include all your business accounts, as you may have selected to set up only some of your accounts from the range available in your primary accounting system. Report Location: From the Financial menu, select the option Summary Extract. Then select Trial Balance, and enter the date range you wish to report on. Select the appropriate landscape background for this report, then run the report. 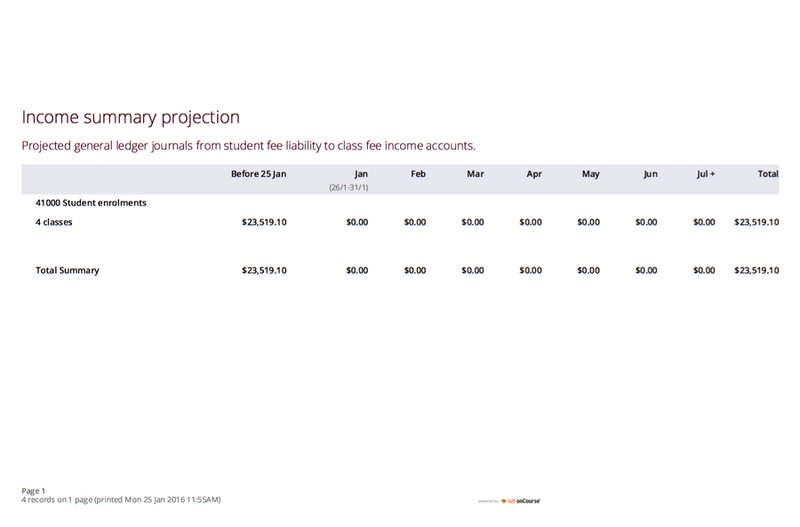 Use: To show the projected pre-paid fee liability to income journals for each of the next 7 months from the date the report is run, for each class. 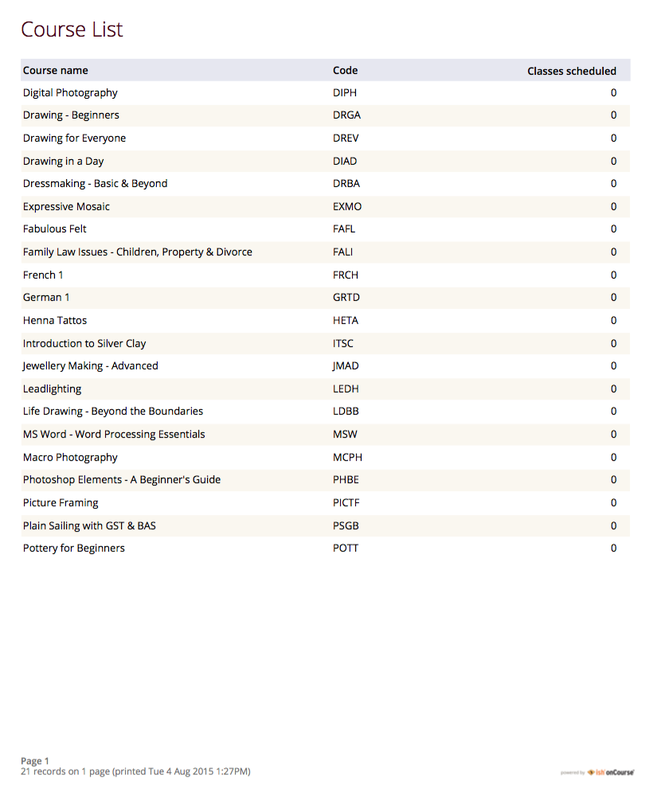 Report Location: From the Discount window, select the Classes you wish to generate the Income journal projectionfor. Go to Share, then PDF and then select Income journal projectionfrom the drop down list of available reports. Remember to select the appropriate background for this report then run the report. Use: To show the summary of projected pre-paid fee liability to income accounts for each of the next 7 months from the date the report is run, for the selected classes. 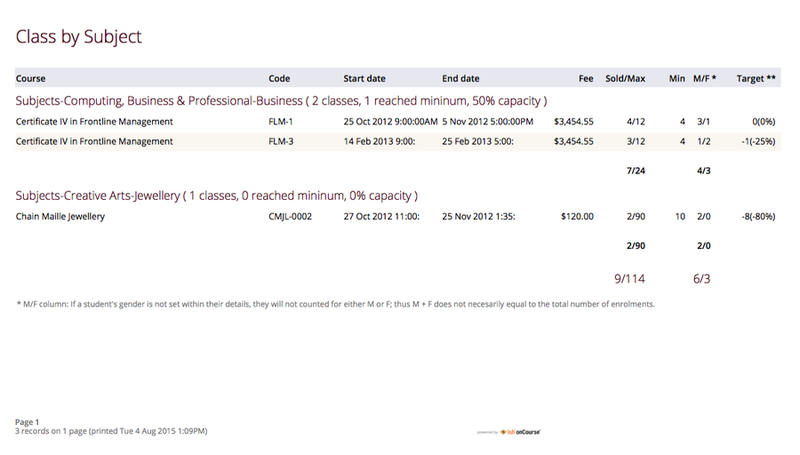 Report Location: From the Discount window, select the Classes you wish to generate the Income journal projectionfor. 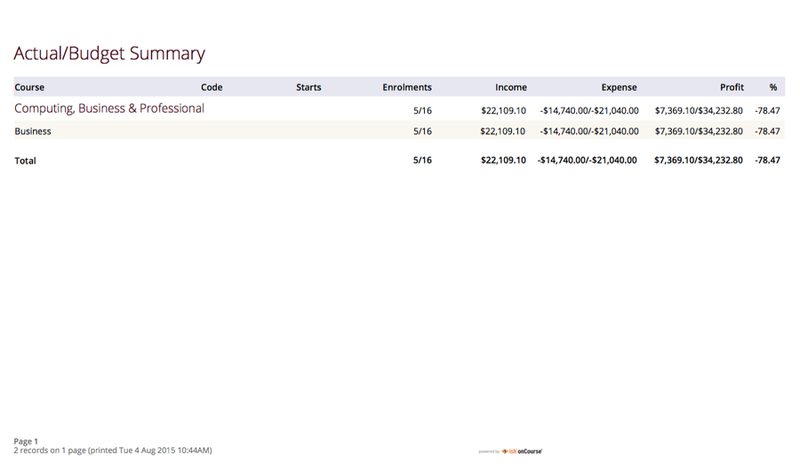 Go to Share, then PDF and then select Income summary projectionfrom the drop down list of available reports. Remember to select the appropriate background for this report then run the report. Use: This report shows during the date range specified, and for each discount chosen, the detail of the enrolments which have taken up a discount offer. Report Location: From the Discount window, select the Discounts you wish to generate the Discount take up reportfor. Go to Share, then PDF and then select Discount Take Up Reportfrom the drop down list of available reports. Remember to select the appropriate background for this report then run the report. 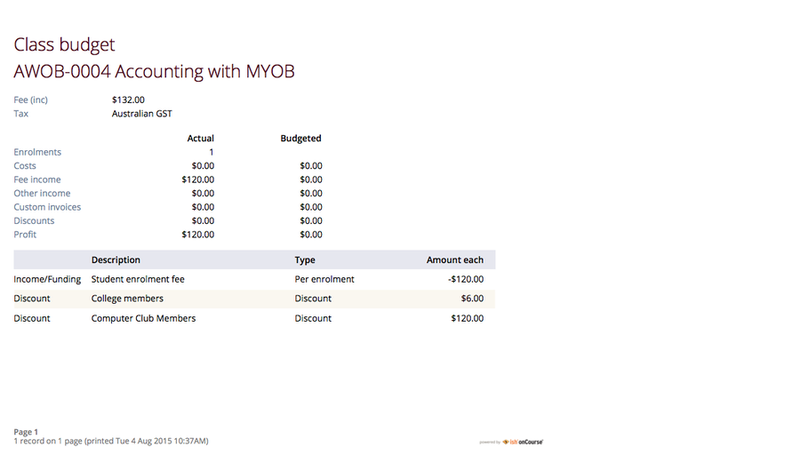 Use: This report shows during the date range specified, and for each discount chosen, how many enrolments for each class have used that particular discount. Report Location: From the Discount window, select the Discounts you wish to generate the Discount take up summaryfor. Go to Share, then PDF and then select Discount Take Up Summaryfrom the drop down list of available reports. Remember to select the appropriate background for this report then run the report. Use: This report shows you the number of enrolments and Income made per account code. 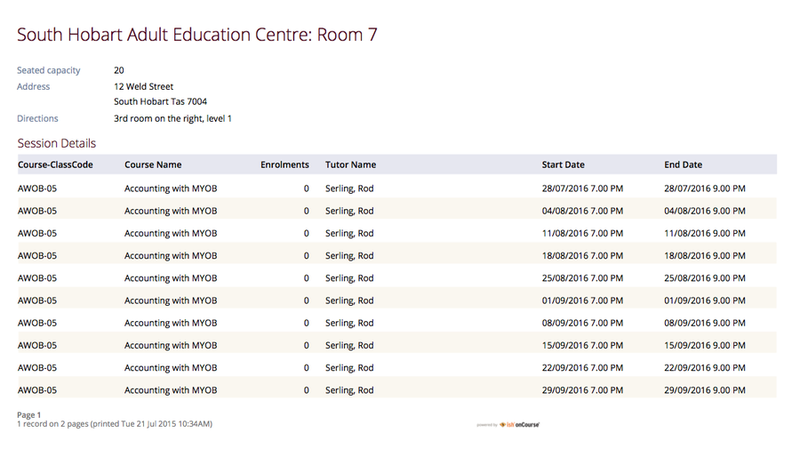 Report Location: From the Class window, select the Classes you wish to generate the Enrolment Summary by Account for. Go to Share, then PDF and then select Enrolment Summary by Account from the drop down list of available reports. Remember to select the appropriate background for this report then run the report. 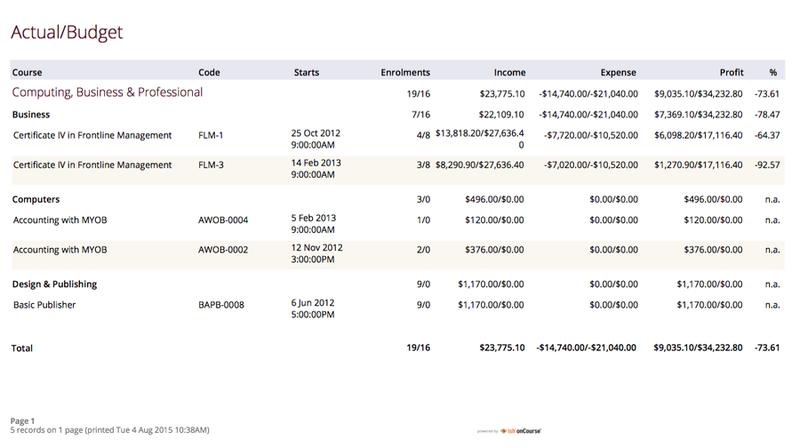 Use: This reports shows the income and number of enrolments every account has taken per class. 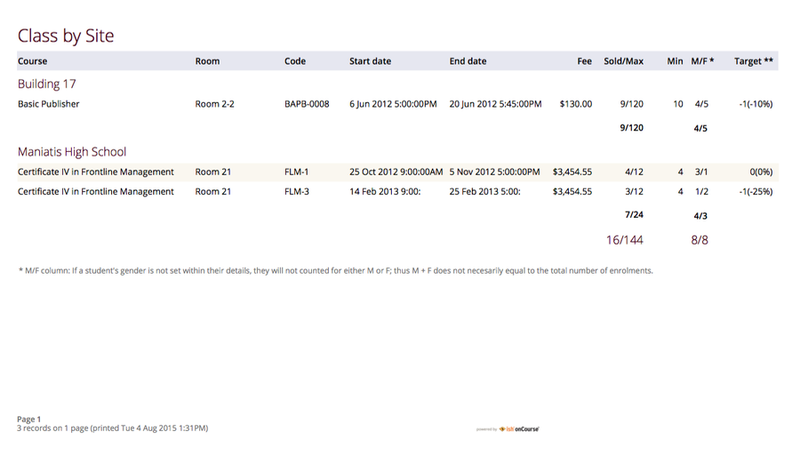 Report Location: From the Class window, select the Classes you wish to generate the Enrolments and Income by Accountfor. 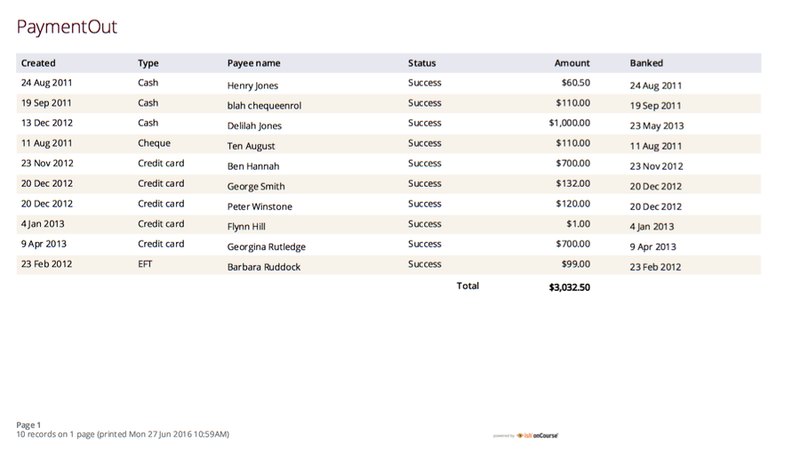 Go to Share, then PDF and then select Enrolments and Income by Accountfrom the drop down list of available reports. Remember to select the appropriate background for this report then run the report. Report Location: From the Enrolment window, select the enrolments you wish to print the notice for, Choose Share, then PDF and Select the Report Commonwealth Assistance Notice . Remember to select the appropriate background for this report then run the report. From the Class window, select the class you wish to print enrolment the notices for, Choose Share, then PDF and select the Report Commonwealth Assistance Notice . Remember to select the appropriate background for this report then run the report. Use: This report shows you a detailed summary of student survey results including a list of all students in a class that completed survey on the student portal, the scores from each student and their comments (if any). The report also shows the average results per class, and the average of all results is displayed at the bottom of the report. 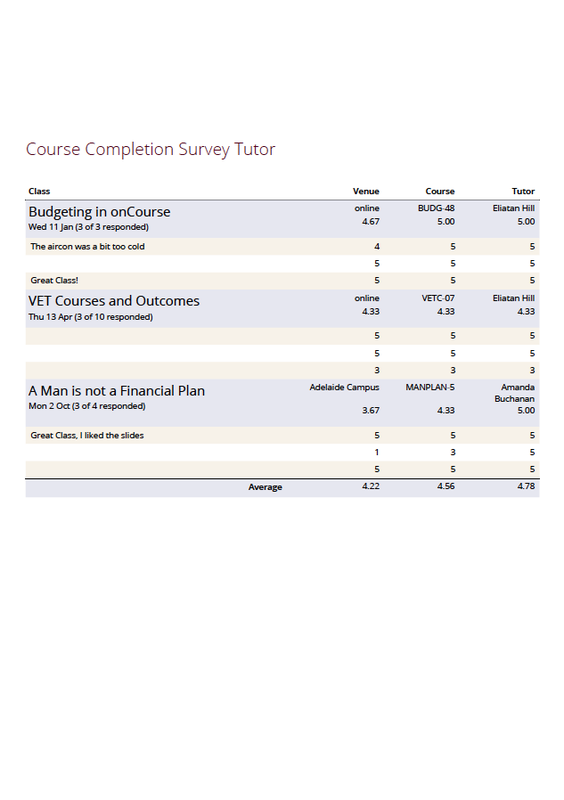 Please note that the Course Completion Survey Tutor report should be used instead if the data will be used outside the office. Report Location: From the Class window, select the Classes you wish to generate the Course Completion Survey for. 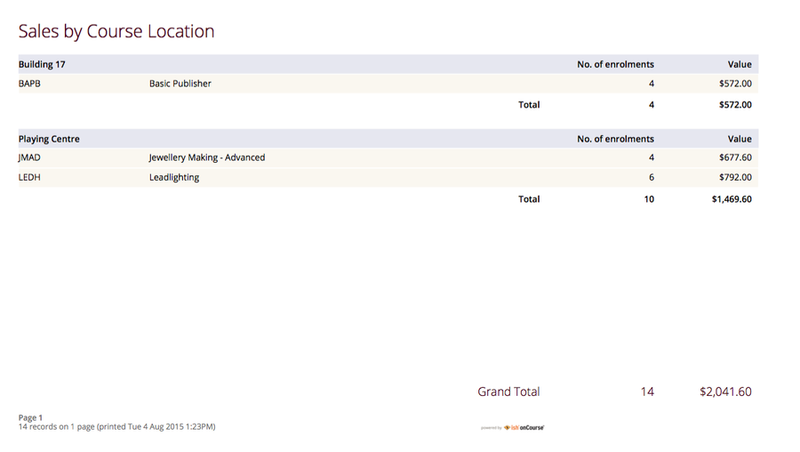 Go to Share, then PDF and then select Course Completion Survey from the list of available reports. Remember to select the appropriate background for this report then run the report. Use: This report shows you a summary of all survey results including the average results for the class. The average of all survey results is displayed at the bottom of the report. Individual student scores or comments are not included. Report Location: From the Class window, select the Classes you wish to generate the Course Completion Survey Summary for. 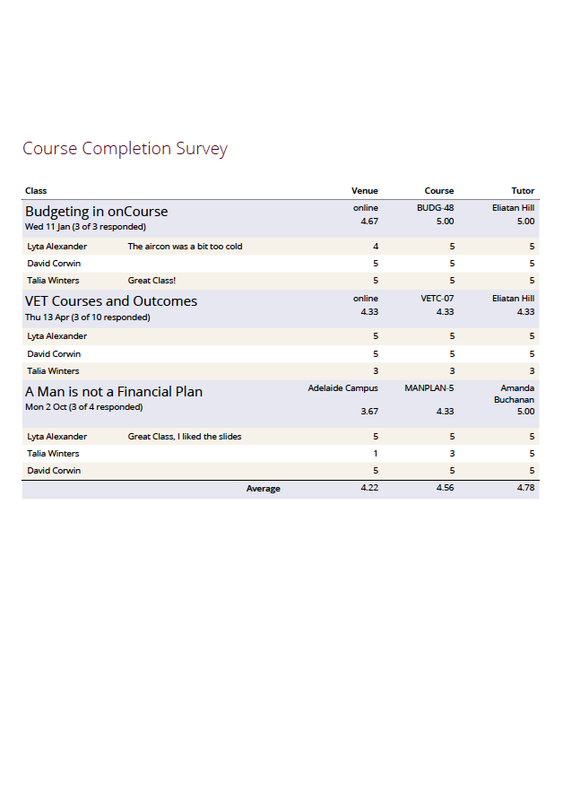 Go to Share, then PDF and then select Course Completion Survey Summary from the list of available reports. Remember to select the appropriate background for this report then run the report. Use: This report shows you a detailed summary of student survey results including a list of all the scores from each student and their comments (if any). The report also shows the average results per class, and the average of all results is displayed at the bottom of the report. This report does not show the name of the students. Please note that due to privacy considerations, this report should be used if the data will be used outside the office. Use: This report shows the aggregate the responses to the standard student demographic questions such as age, gender, residential suburb, country of birth and language spoken for a selection of classes or enrolments. Report Location: From the Class list view or the Enrolment list view, select the Classes/Enrolments you wish to generate the Demographic Data Report for. Go to Share, then PDF and then select Demographic Data Report from the list of available reports. Remember to select the appropriate background for this report then run the report.